8 September 2013: Again I didn't get much time to work. 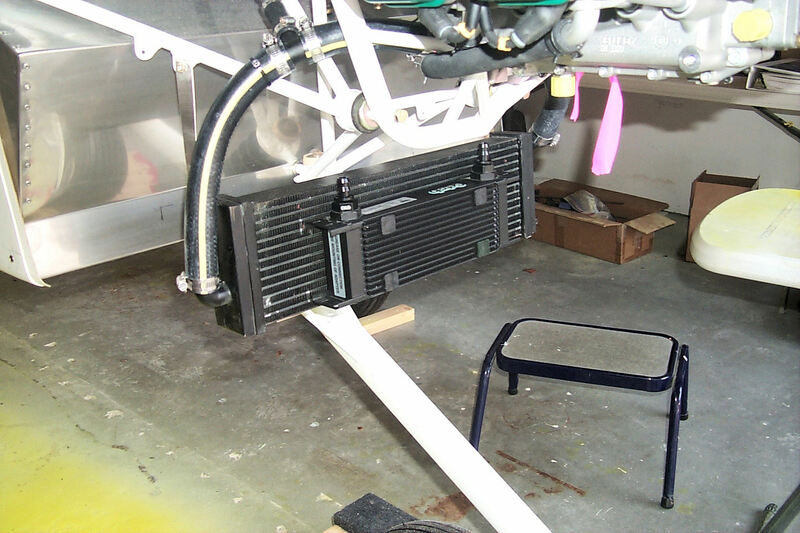 I did have enough time to install the brake fluid reservoir. 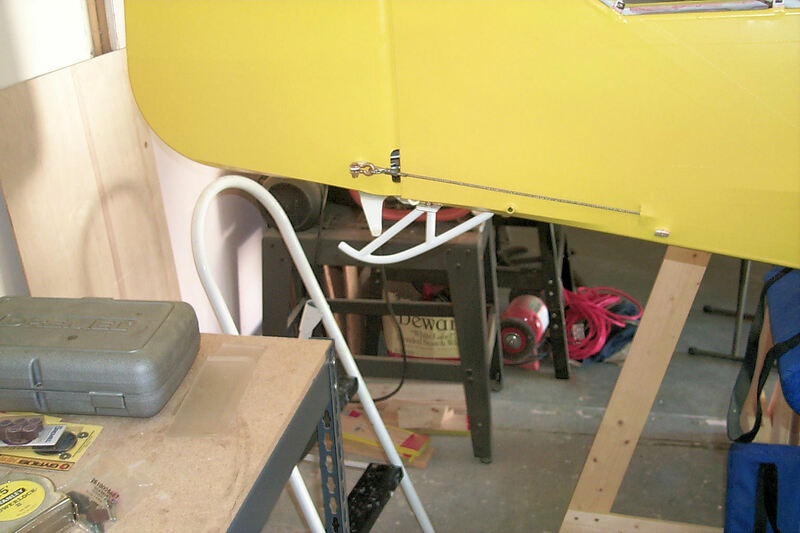 13 September 2013: The rudder is rigged! I'm using shackles instead of links and any keen observer will notice that I've used boat shackles instead of aviation shackles. I'll probably change to aviation shackles but, I have to say, I like these shackles very much. My experience with boats has led to another decision. I'm not encasing the swages with shrink tubing. 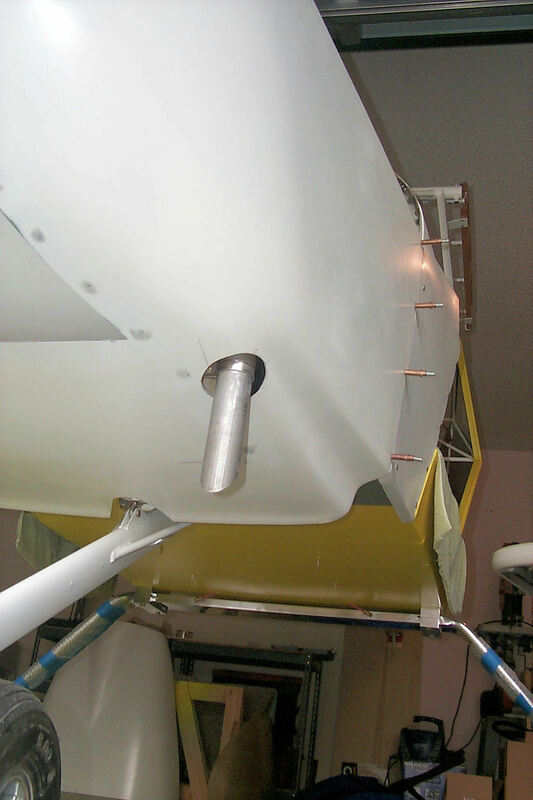 My life aboard sailing yachts has taught me that stainless steel will corrode when denied contact with the atmosphere. The downside of this is that it leaves meat hooks to catch me during preflights. 15 September 2013: You're right, we're wimps. 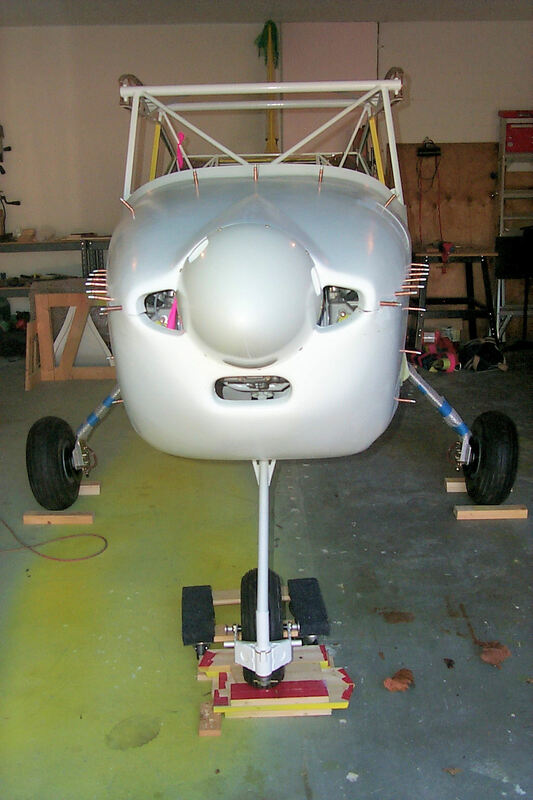 Our Kitfox is a nose dragger. We decided that, if after a long day of flying, we have to deal with a 15 knot direct crosswind. 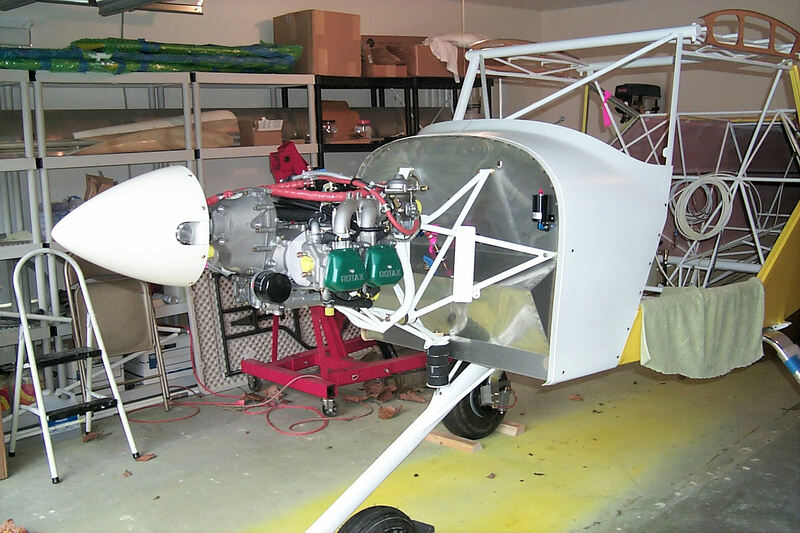 We'd rather do it in an airplane with a training wheel. This was one of those two-hour jobs that took all day. 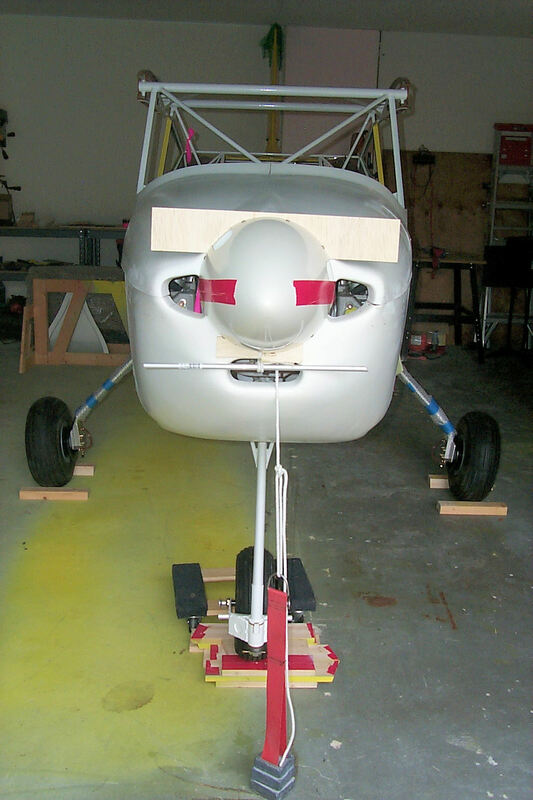 20 September 2013: I switched to aircraft shackles. 22 September 2013: Another all-day two hour job. The piston rides in a bearing that should have a little play. Getting it right takes finesse, patience, and bad language. 29 September 2013: Civic responsibilities pull me away from kit building. 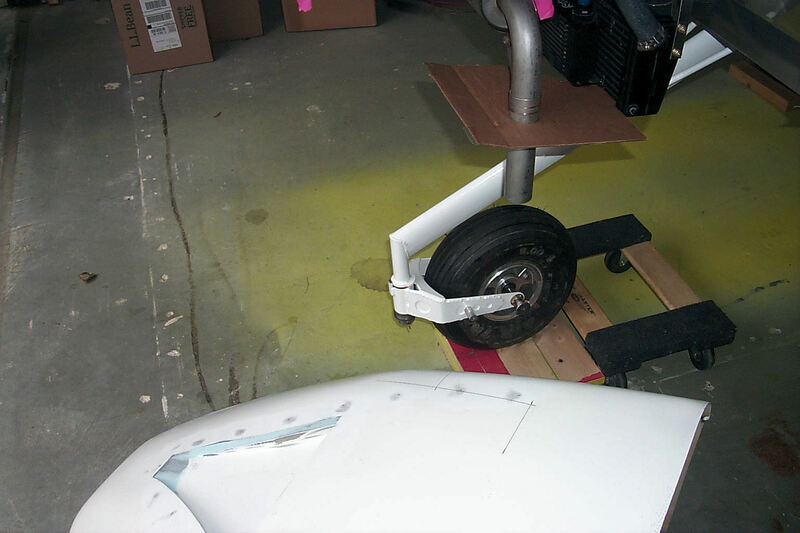 Today, however, I was able to fit the nose wheel fork. Like most anything else the parts don't necessarily fit without some careful filing and grinding. As an example the bearings did not want to go on the shaft until I opened them a few thousands of an inch with a spindle sander. 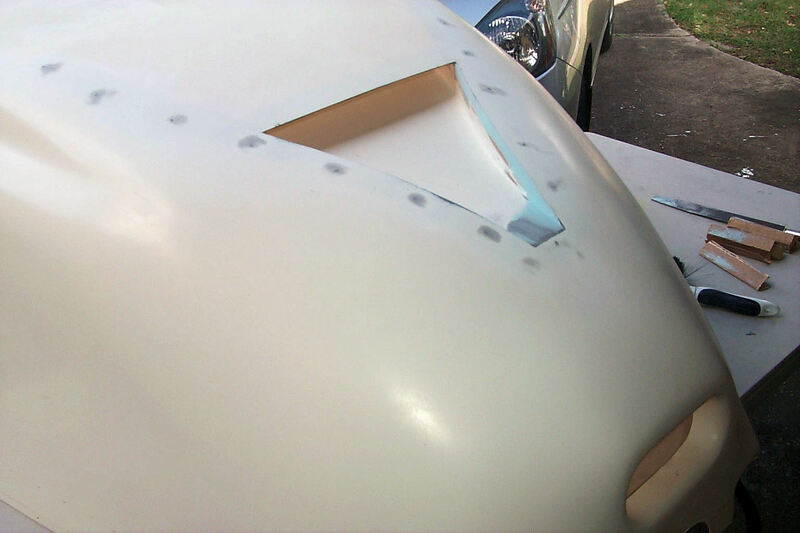 Not wanting to remove too much material I worked very carefully. Things always take more time when you're trying to get it right. You can see the stack of belleville washers above the bottom nut. By compressing them with the nut you can create a measurable amount of drag when trying to swivel the fork. Using a fish scale I tightened the nut until it took 10 lbs of pull to keep it moving. This meets the requirements specified in the Manual but, also according to the Manual, I left the cotter key temporarily in place in case taxi tests prove I need more or less tension. 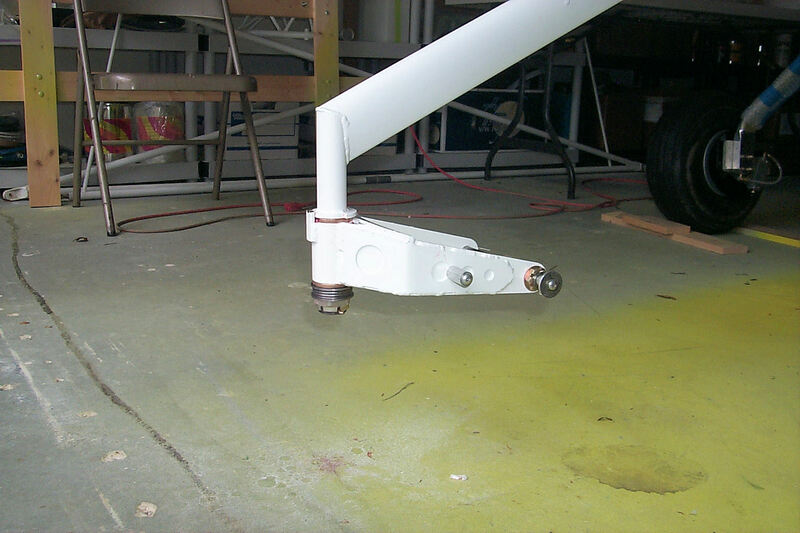 Too little tension can promote nose wheel shimmy. I get enough of that with my Cessna. 11 October 2013: Pink! With my brother's help we charged the brakes with fluid. The good news is that there are no leaks. 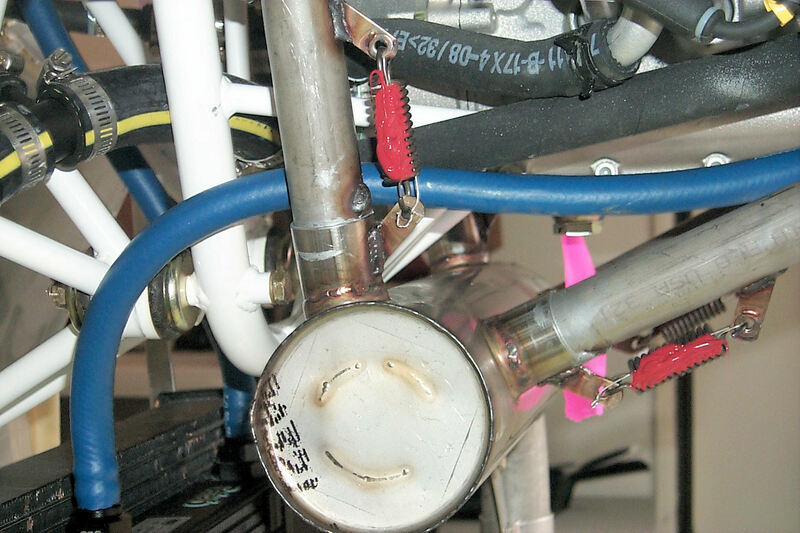 The bad news is there is a massive bubble in the copilot's left cylinder that I can't purge. Tomorrow I'll try some really bad language. That should do it. 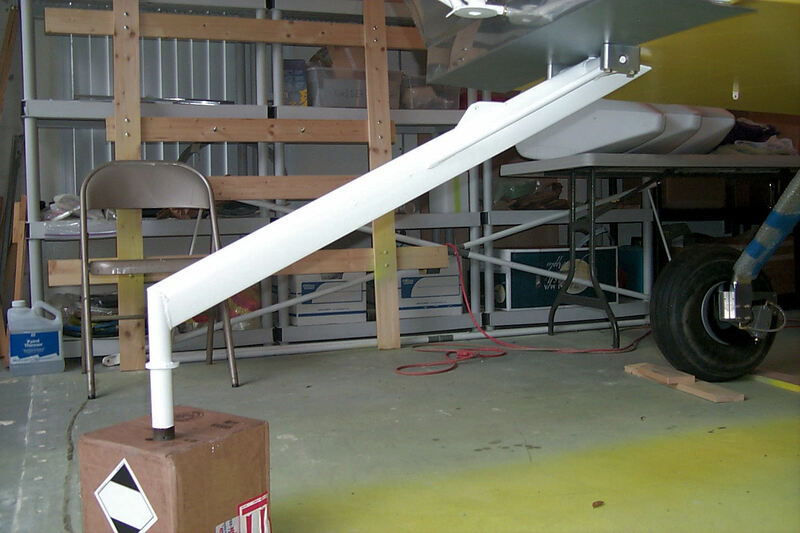 I was successful mounting the tail skid. 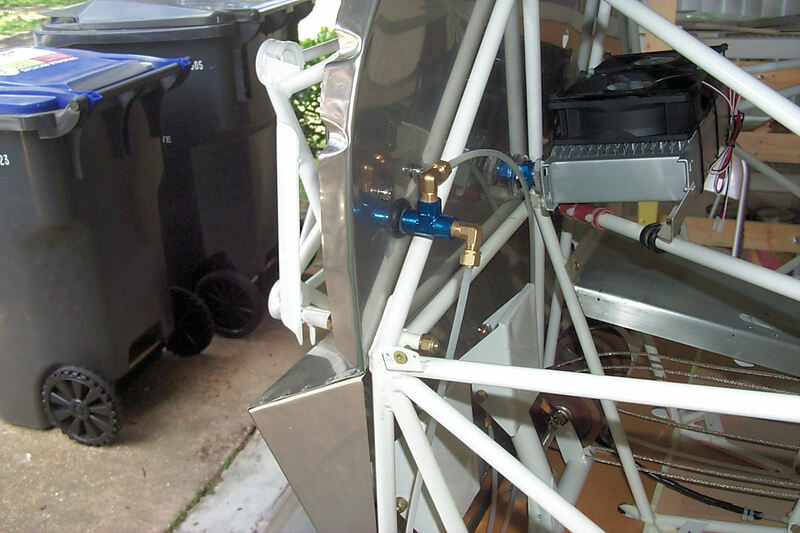 13 October 2013: After two days trying the clear the "bubble" in the copilot's left brake cylinder and having no luck I'm becoming convinced that the cylinder is faulty. Time to climb Mount McBean and have an audience with the master. 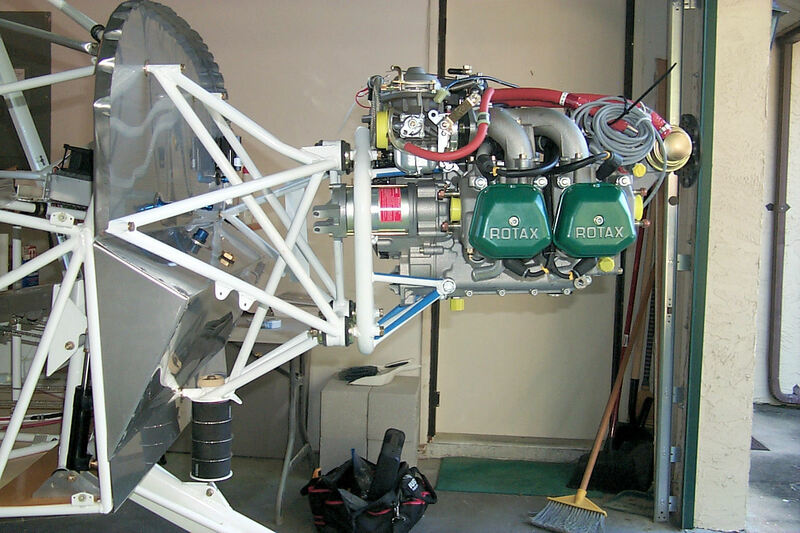 Meanwhile, I'm preparing to mount the engine. 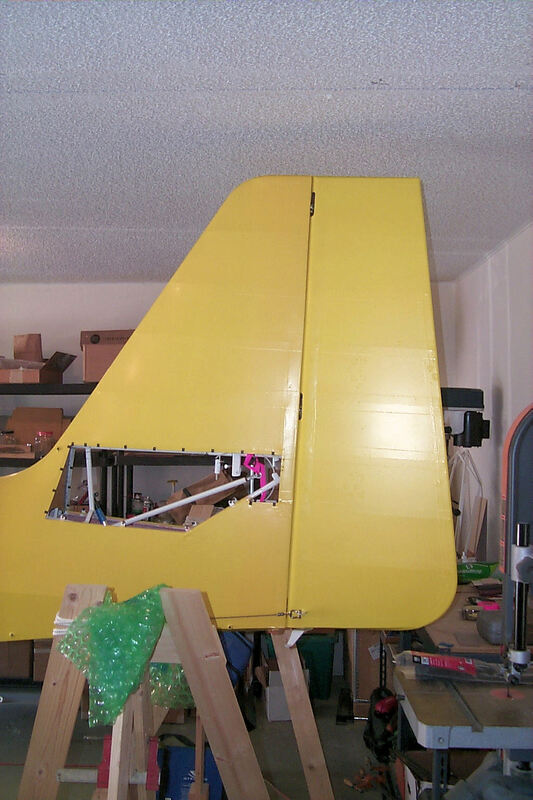 The first step is to shorten the fuselage by removing the rudder. 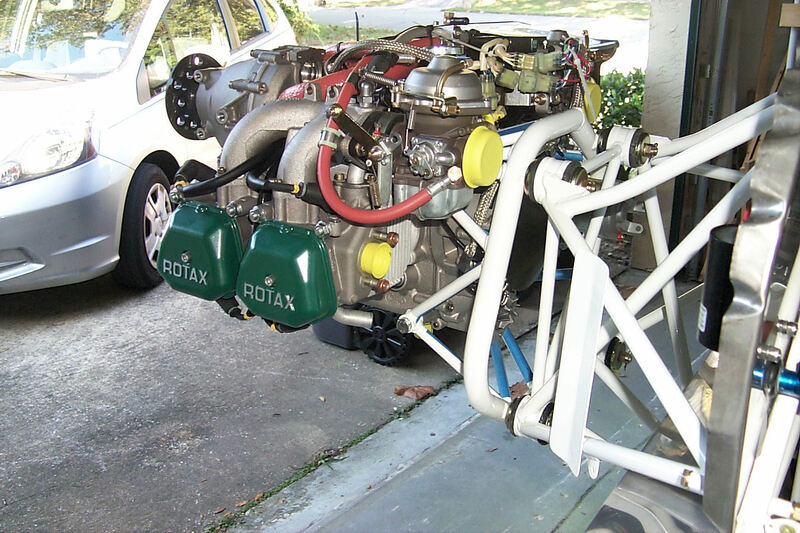 This will allow more room on the other end for the engine. 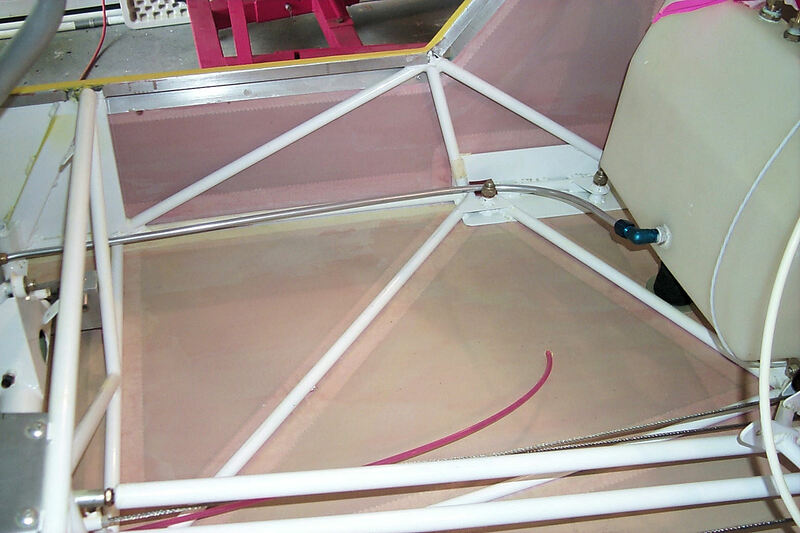 In the photo you can see that I improvised means of keeping the rudder cables taught. This will help me route wires, fuel lines, etc. 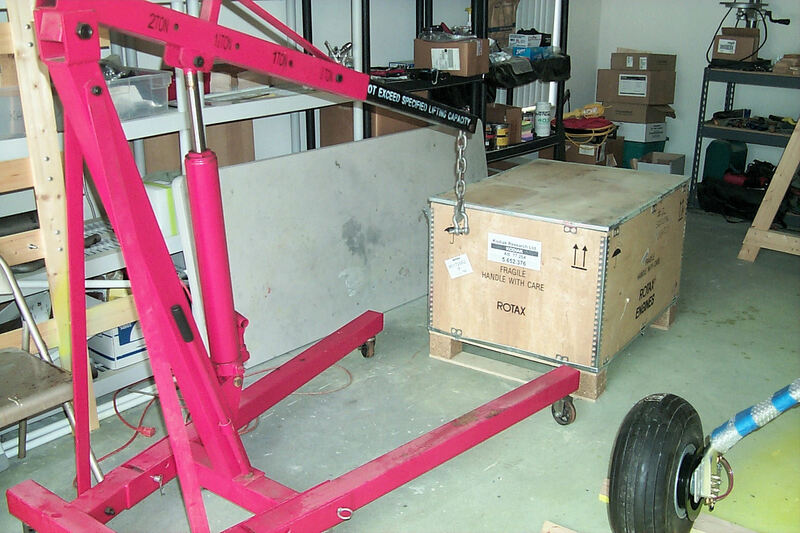 18 October 2013: The faulty cylinder is on its way to Grove for testing. 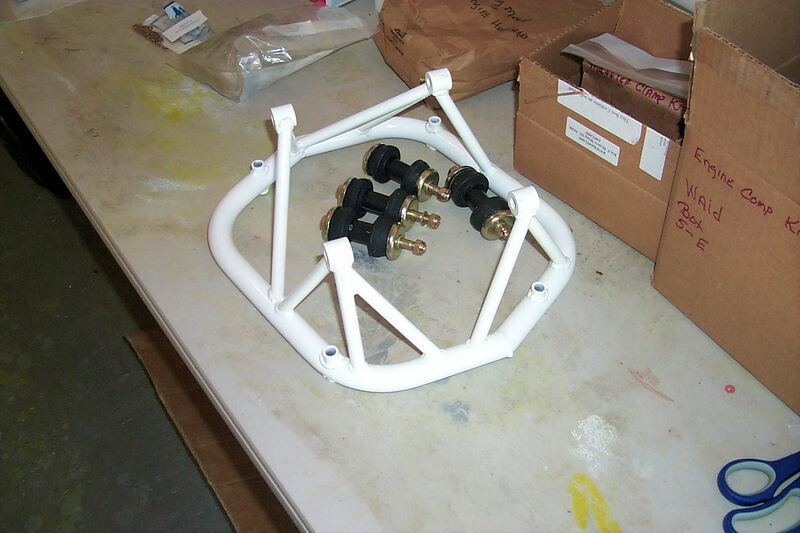 Meanwhile, I'm gathering all the parts for mounting the engine. 19 October 2013: With a little help from my friends! 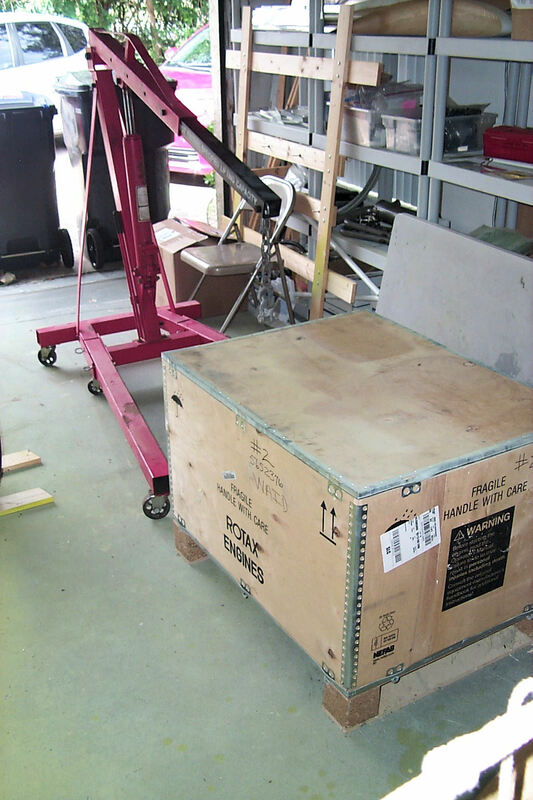 We fetched the engine hoist from my hangar, rearranged the shop, and pulled the engine out from the corner. 22 October 2013: I'm ready! 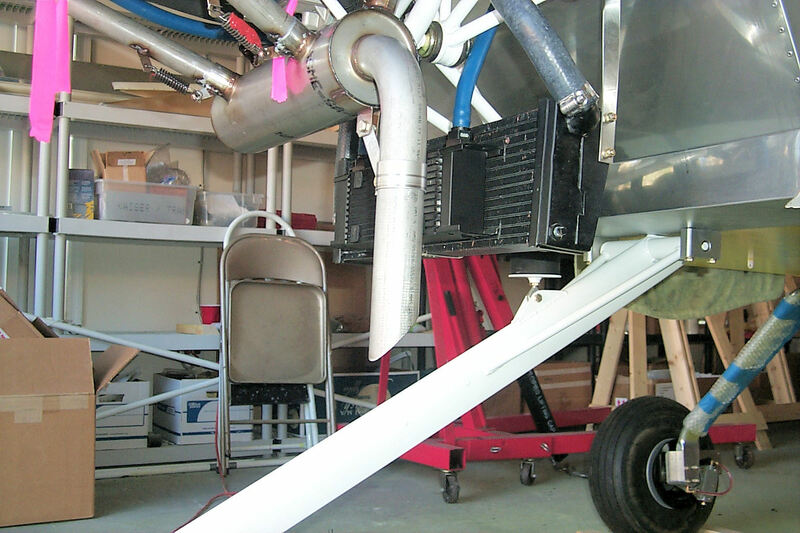 I spent the day unpacking the engine and gathering everything needed to mount it to the fuselage. In a few days my friend will be over to help me. I don't want to do this alone. 27 October 2013: A Milestone! 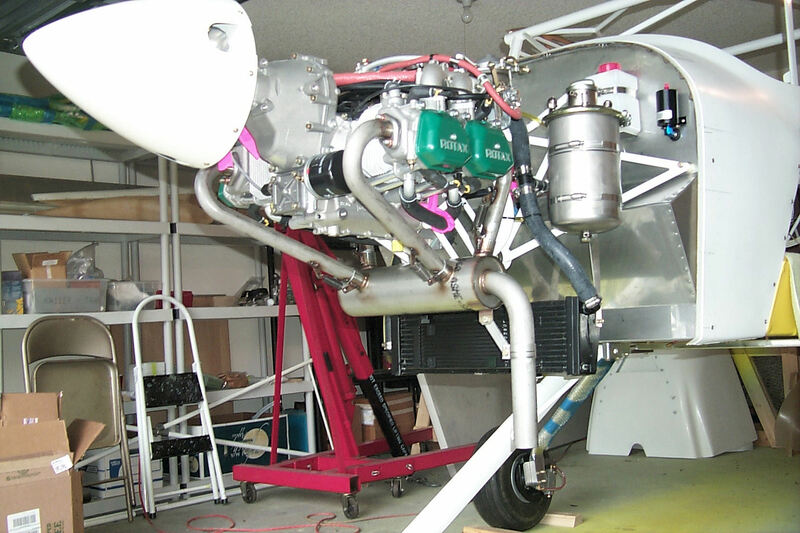 The engine is mounted! I couldn't have done this without my friend. 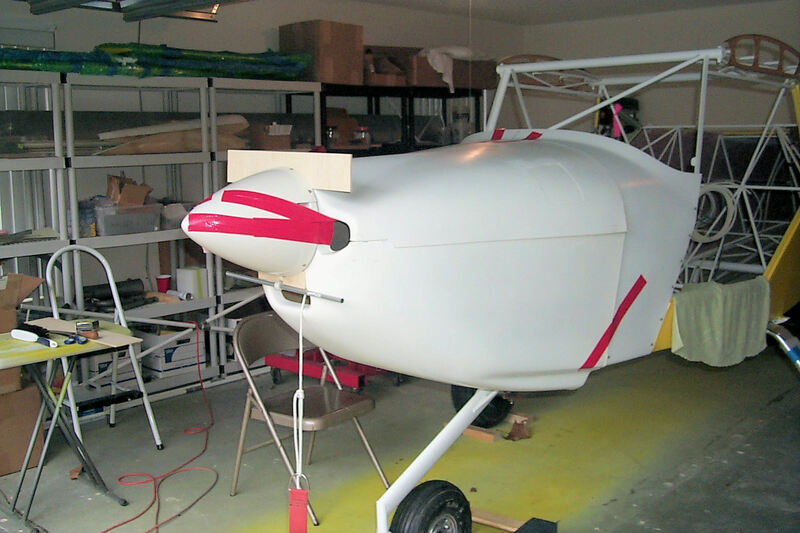 He's an aircraft mechanic that provided both labor and expertise. These photos were taken just after we finished. 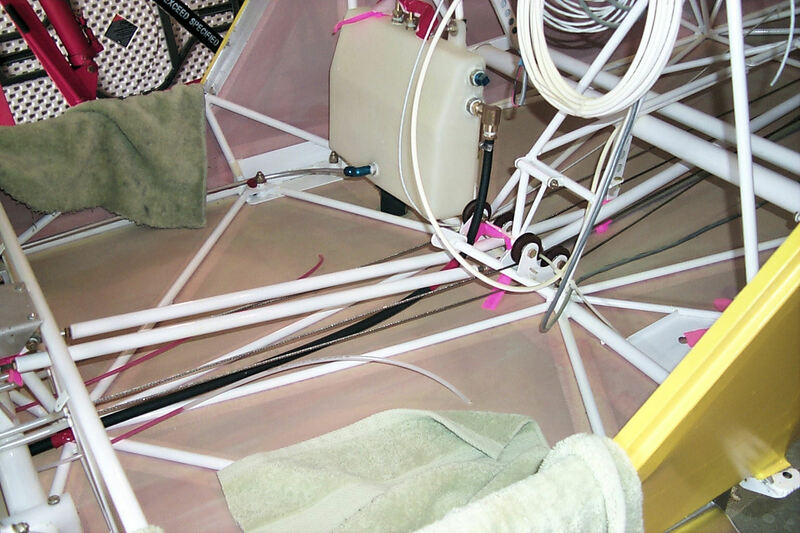 You will notice that, aside from the blue masking tape that protected the ring mount while we were installing it, the water pump had been removed. The ring mount would not have slipped in with the water pump in place. 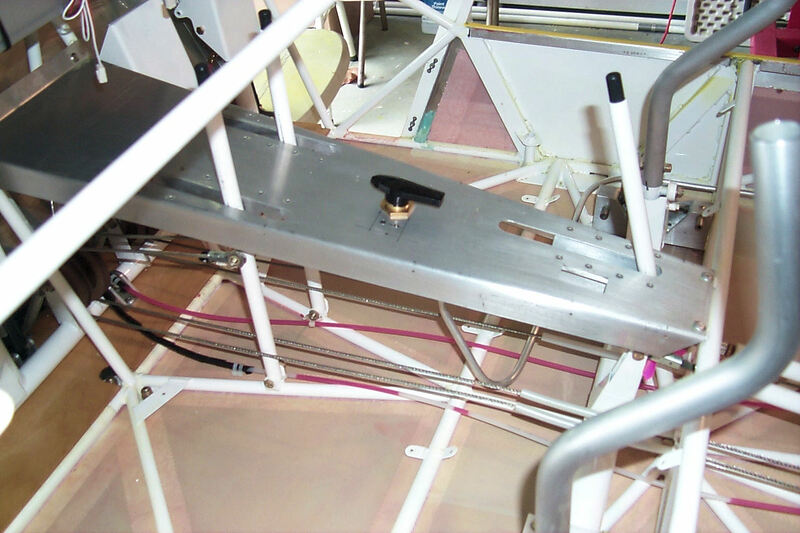 Also the wires from the trigger coils to the ignition modules had to be detached in order to thread them through the ring. I now have to carefully reassemble the engine. 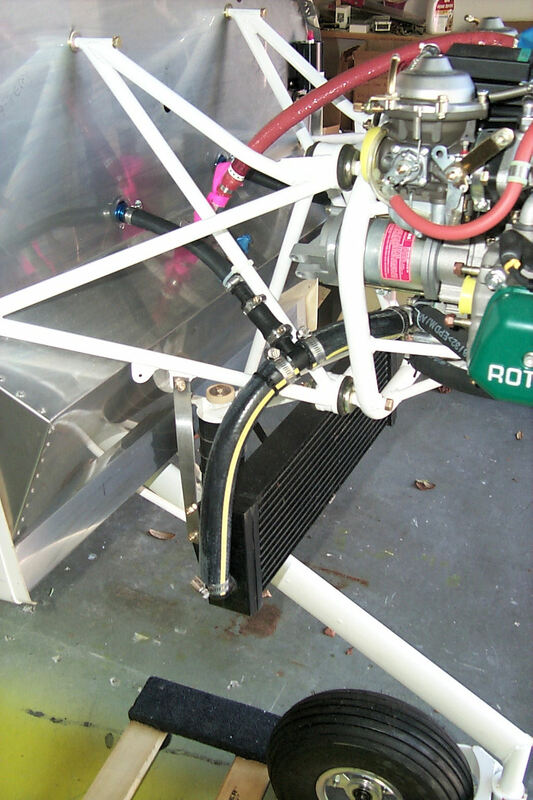 2 November 2013: For the last couple of days I've started work on the fuel system. 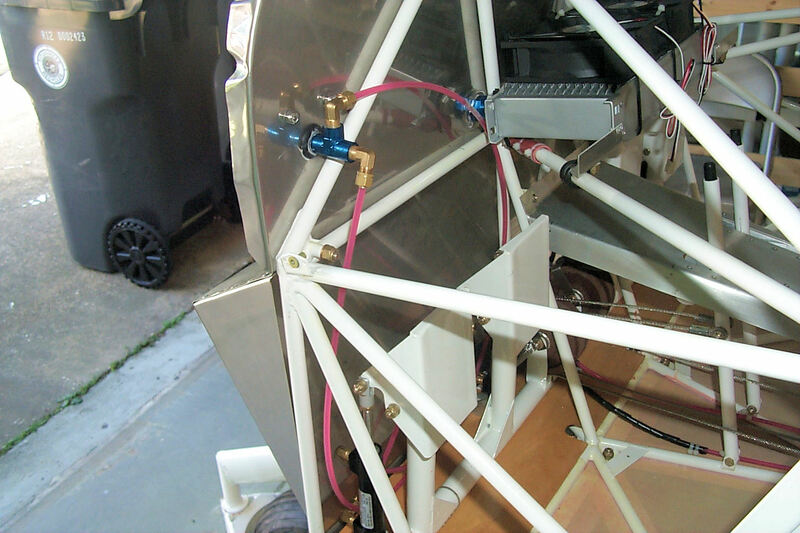 I installed the fuel valve on the center consol and connected it to the header tank with aluminum tubing. The fitting on the header tank doesn't inspire confidence. I'll rigorously test it before flight. 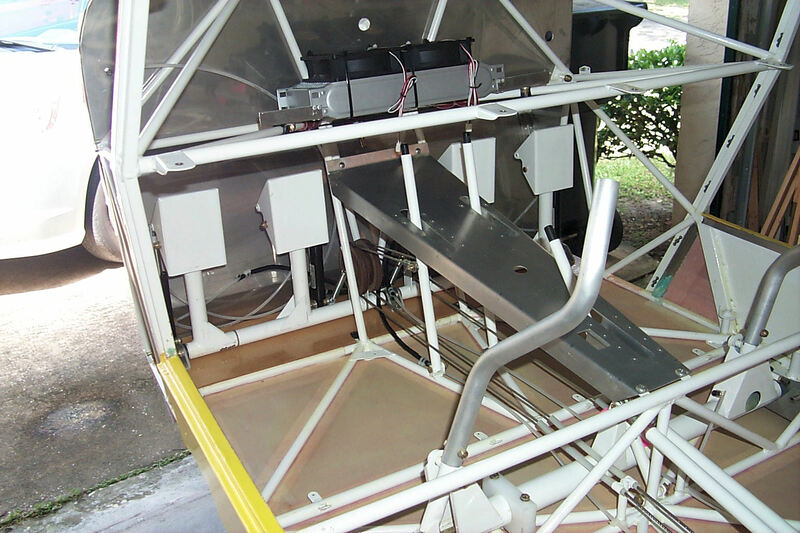 5 November 2013: Fuel flow sensor. 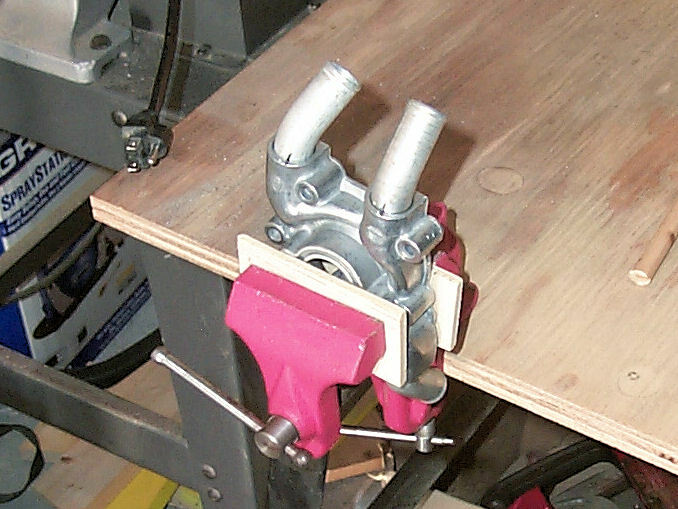 I devised a bracket that tilts the forward side upward. This is recommended to allow any bubbles to flow through the sensor instead of becoming trapped. 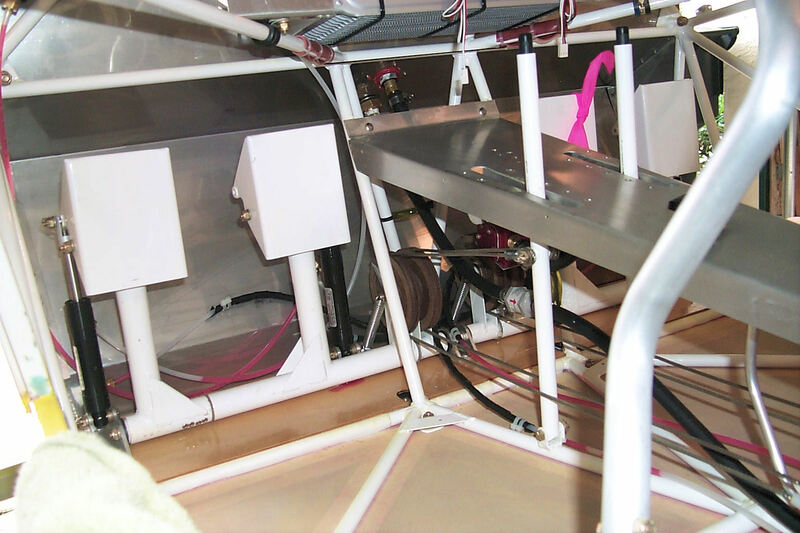 8 November 2013: The fuel hose is installed! From the valve to the sensor and from the sensor to the firewall. 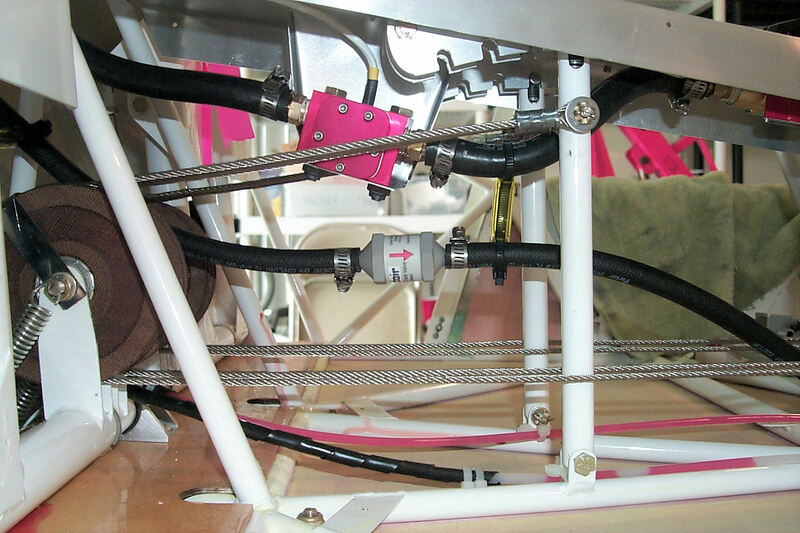 12 November 2013: Fuel return line. 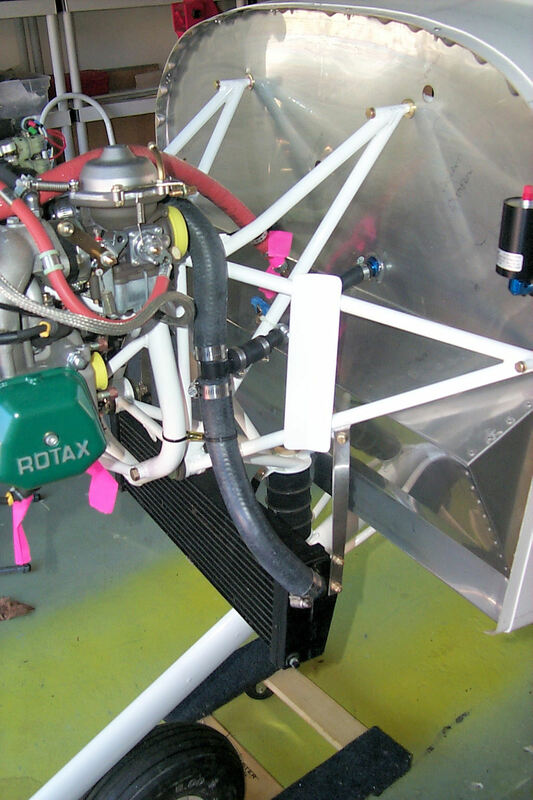 To avoid excessive fuel pressure Rotax requires a return line to the header tank. A restrictor limits the flow to a small amount. 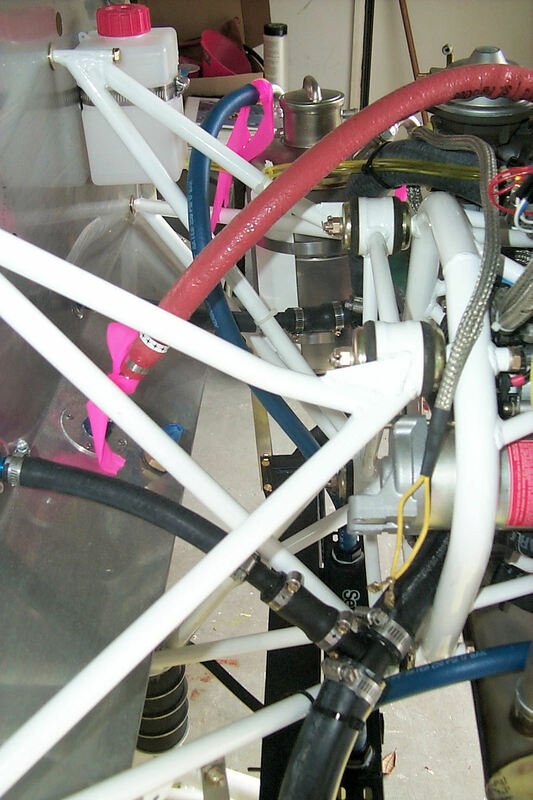 You can see that I installed a check valve to prevent fuel flowing the other way. 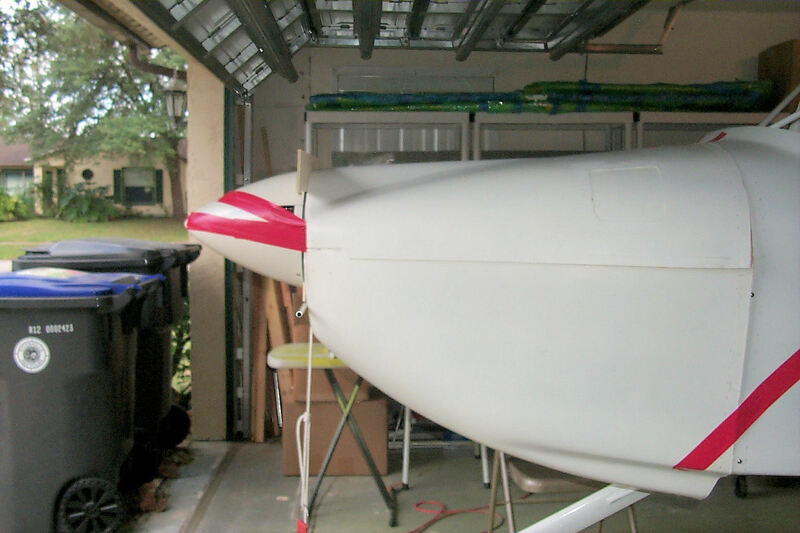 15 November 2013: Before I even fly I'm replacing parts. 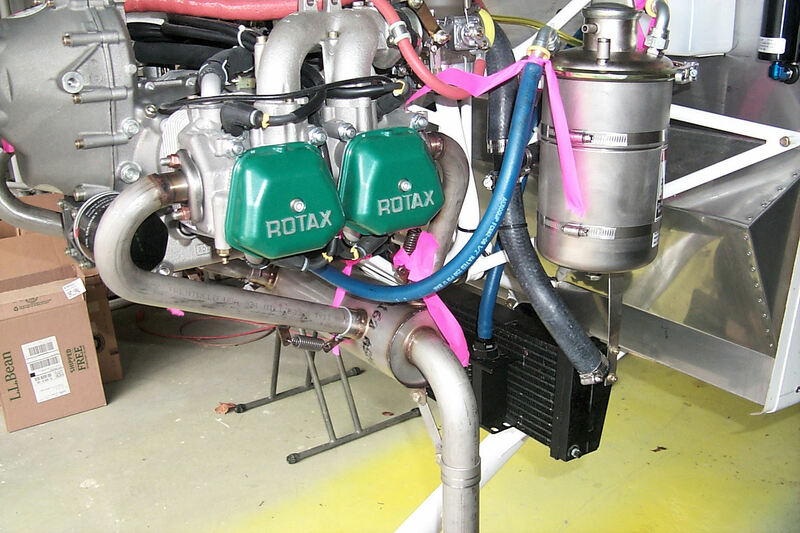 Rotax issued a Service Bulletin on the particular model fuel pump on my engine. By necessity I had to replace it with a newer model pump. 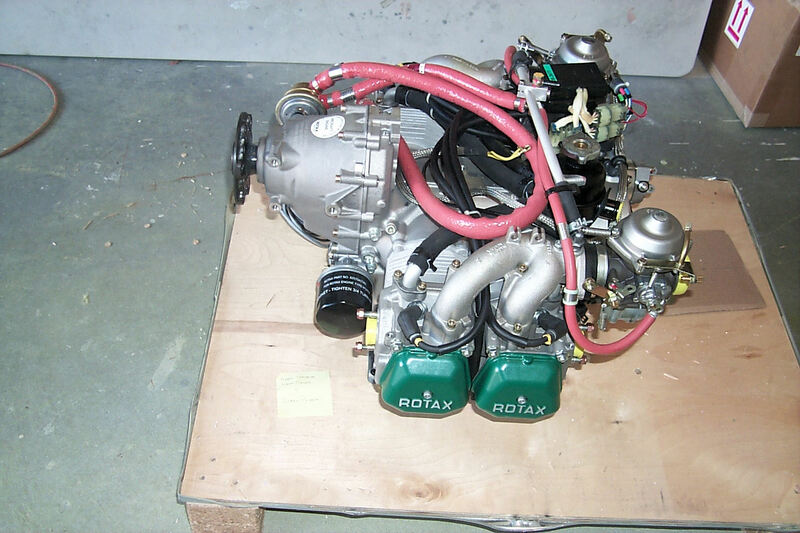 Rotax is covering the costs. 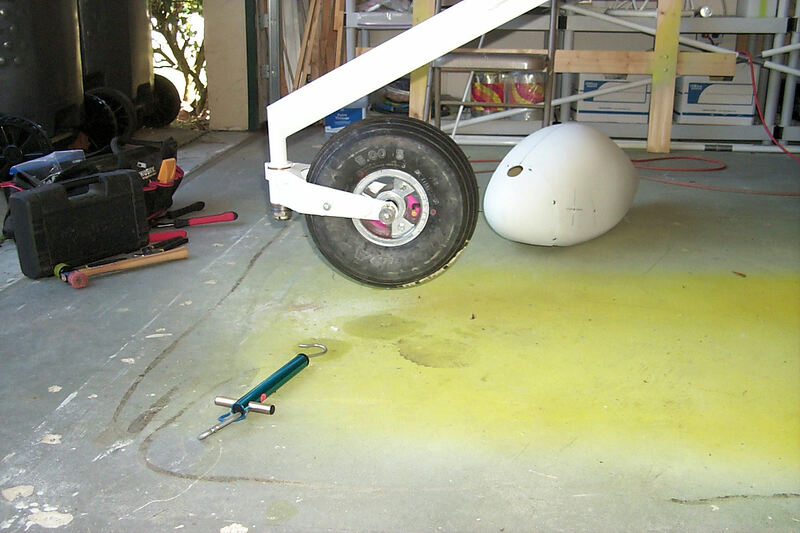 In addition there is a step by step instructional video on rotaxowner.com. Your keen eye will notice that I left the fire sleeve unsecured which is the reason for the pink tape. 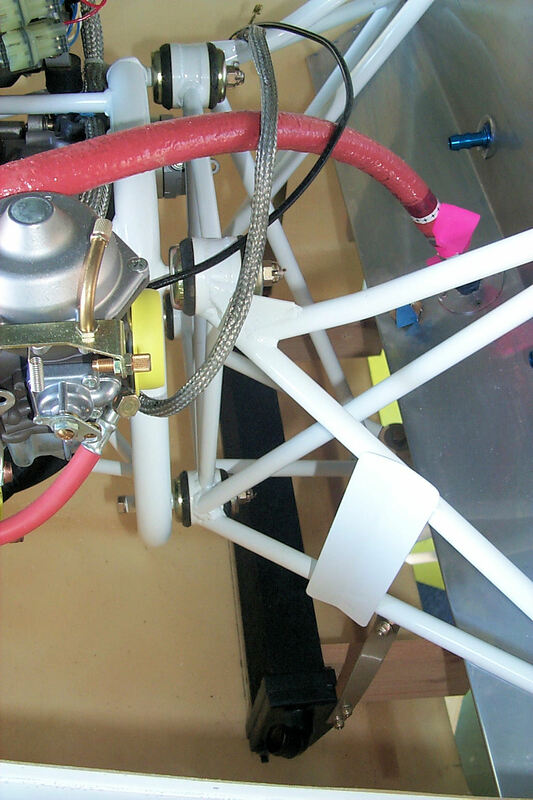 After I run the engine and verify that there are no leaks I'll clamp the fire sleeve. 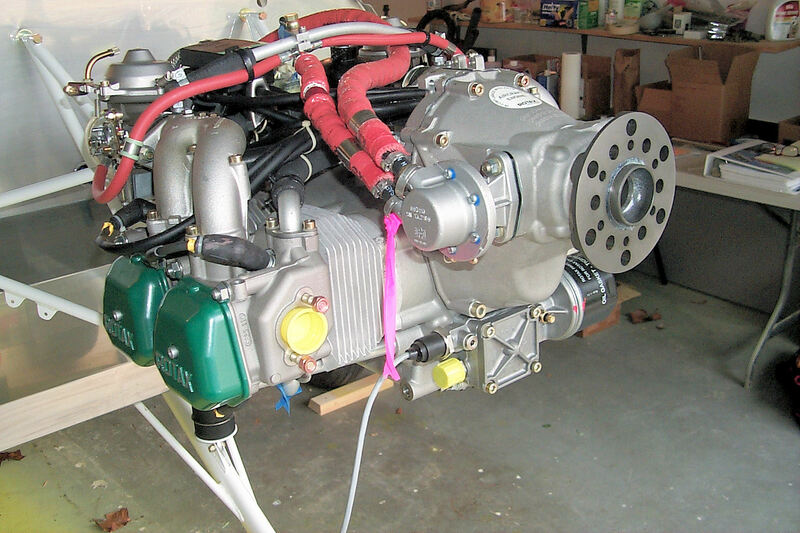 I'm a little held back, If you remember I had to remove the water pump housing to install the ring mount. I've yet to reinstall in because I have to re-orient a cooling hose elbow to accommodate my particular ring mount. Again there's a nifty video explaining how to do this. It specifies that I must re-seal the elbow with Locktite 648 and I've had a tough time trying to find it. Not at the hardware store, Aircraft Spruce, or the auto store. I finally found it at Lockwood Aviation. As I type it's in the mail. 23 November 2013: It all comes together. In addition to the Locktite 648 I had to order a 45 degree elbow to replace the 80 degree elbow that came with my engine. 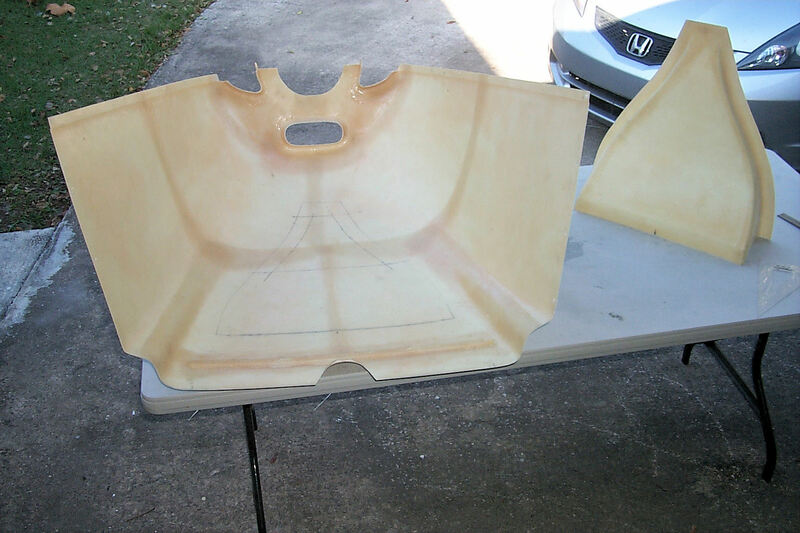 Here it is put together with the locktite curing. 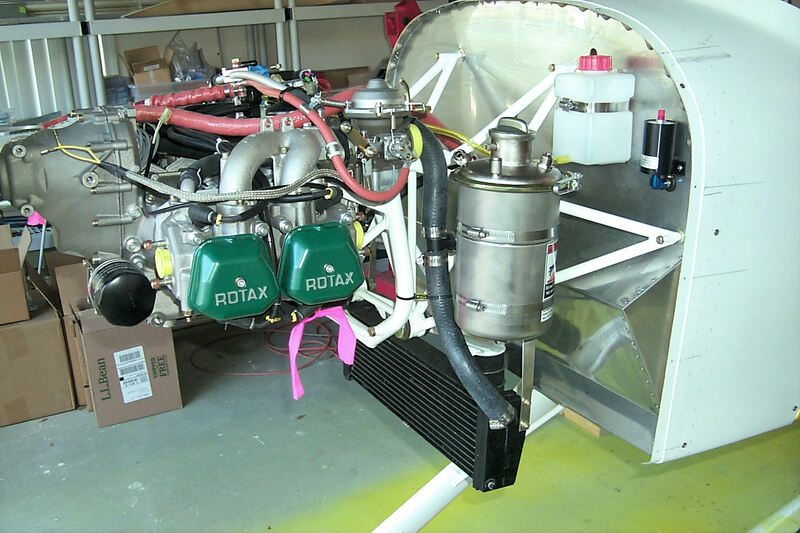 If there are no more delays the water pump housing will be back on the engine tomorrow. 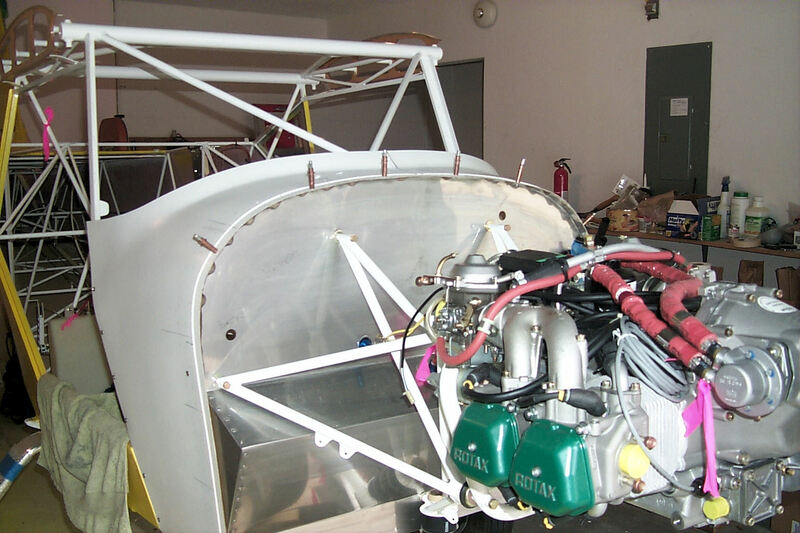 24 November 2013: Before I mount the radiator and plumb the cooling circuit I must fit the cowling. 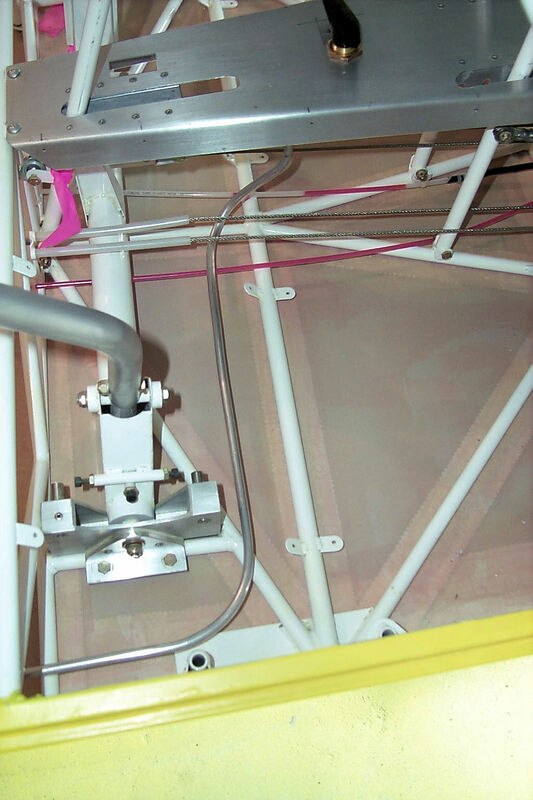 This is because the radiator must be precisely positioned in relation to the air intake on the cowling. 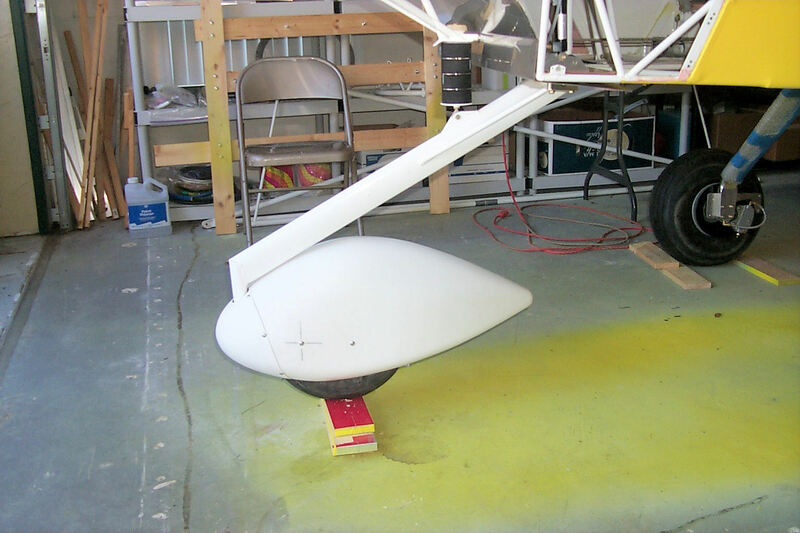 The first step is to mount the propeller spinner. In the second photo you'll notice that the lugs are not completely driven home. 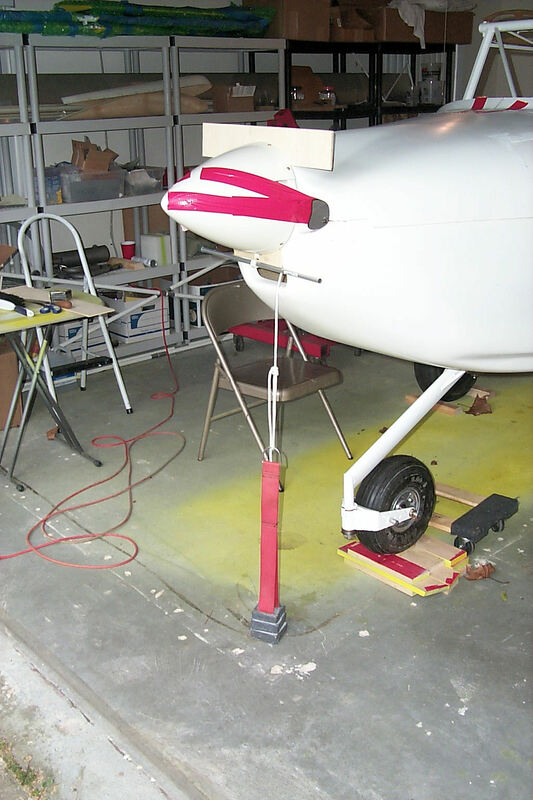 Since I fitted the propeller bolts only hand tight the lugs stopped at the point where the diameter of the lug increases. 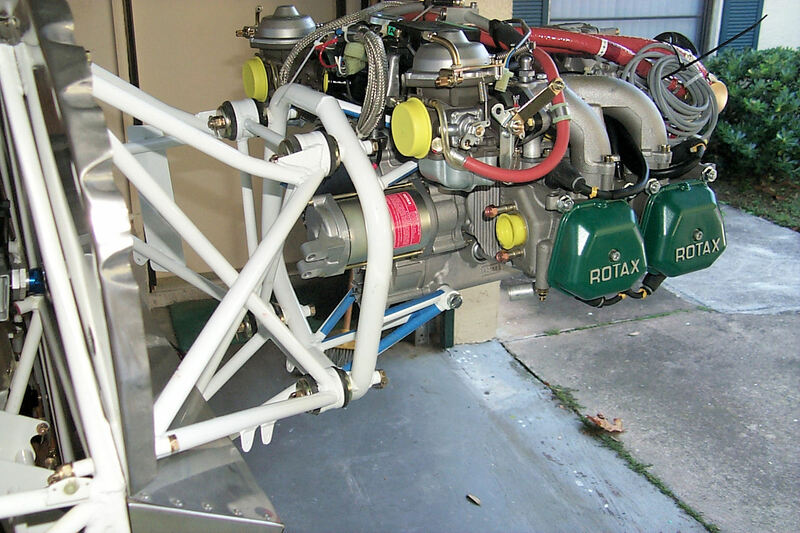 When I finally install the propeller I'll torque the bolts to the specified amount and the lugs will find their permanent home. 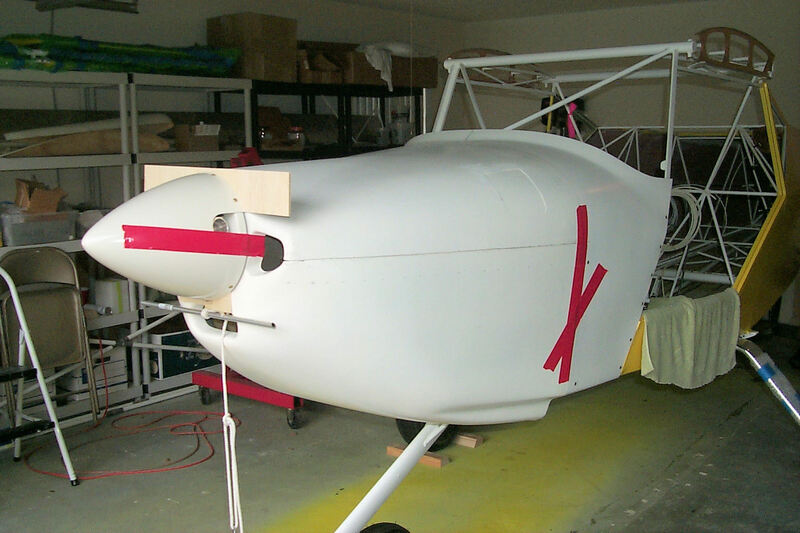 Meanwhile I had visit from a fellow Kitfox builder today. I truly enjoyed talking Kitfox with her. 27 November 2013: Getting the top and bottom to nest together. I started at the front. Quite a lot of time was spent getting it right. 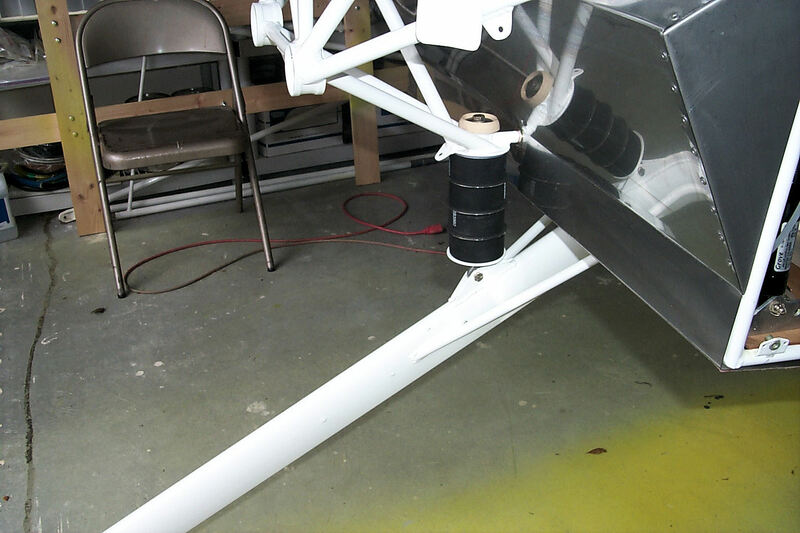 The third photo shows the notch for the nose gear. 29 November 2013: Duct Tape! 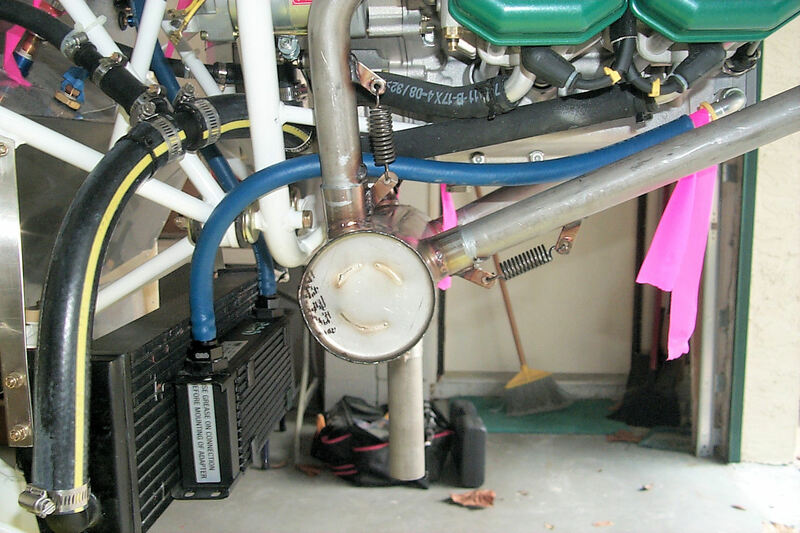 I once fixed a leak on my sailboat with duct tape. 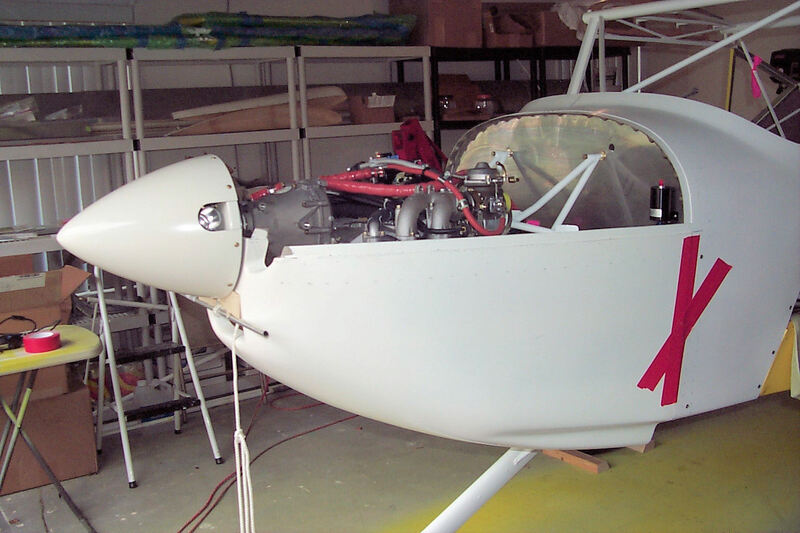 This time I'm temporarily positioning the cowl of the kitfox for marking the cut lines. 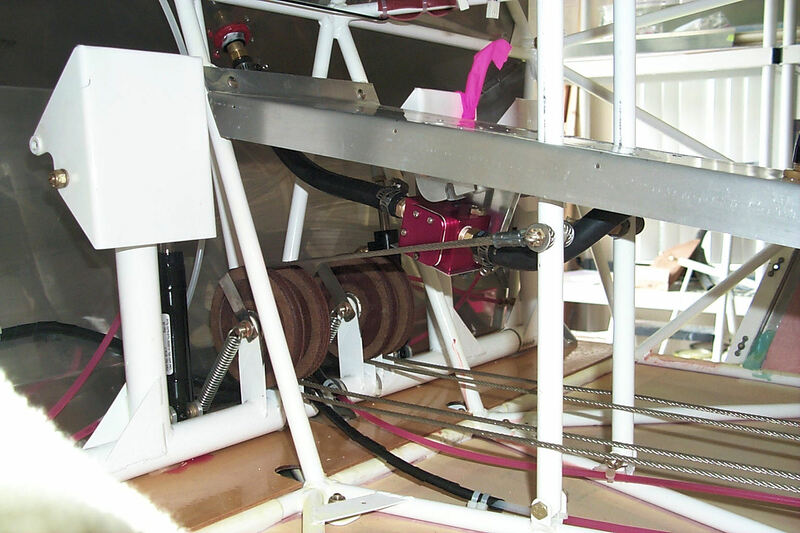 The weight is supporting a makeshift tackle to hold the cowl in vertical alignment. 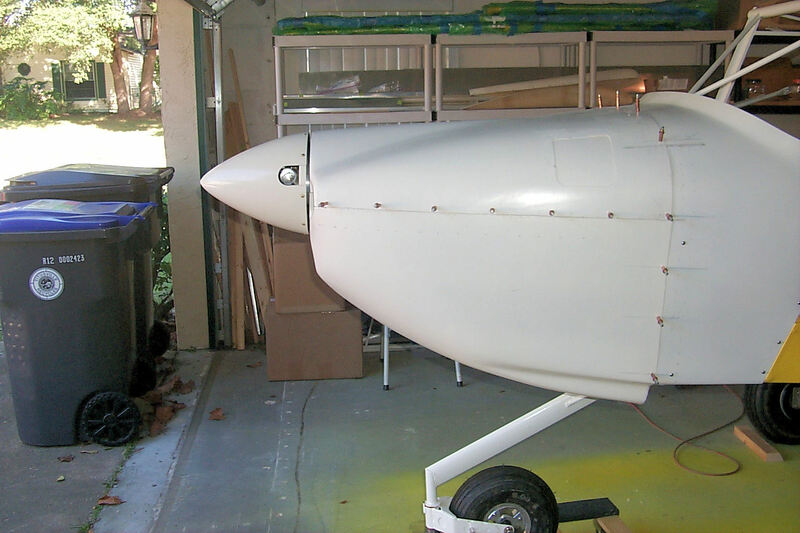 The gap between the spinner and the cowl is established with bits of plywood. 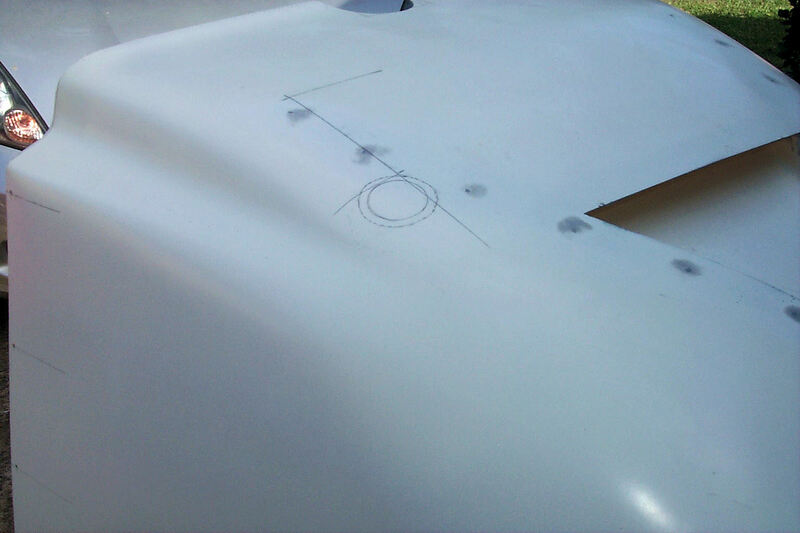 I marked the aft cut line but, I won't cut until I sleep on it. 30 November 2013: No disasters! 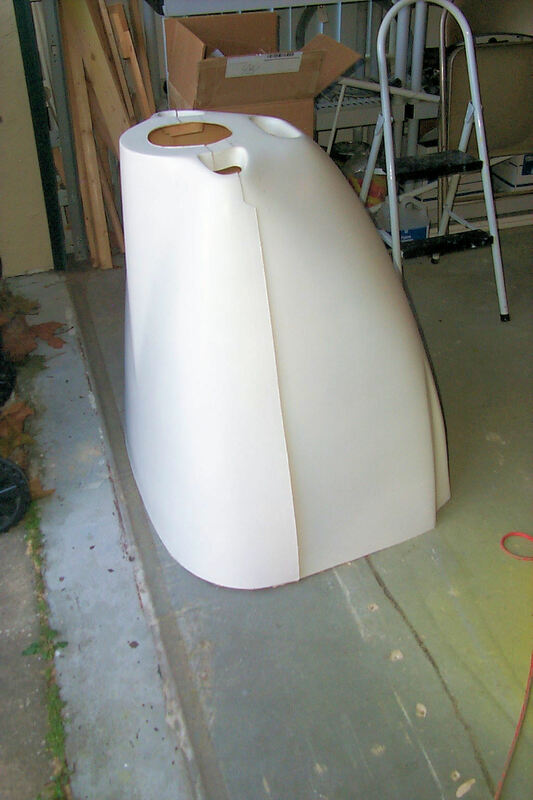 (So far) The cuts have been made and the cowl is fitted in place. 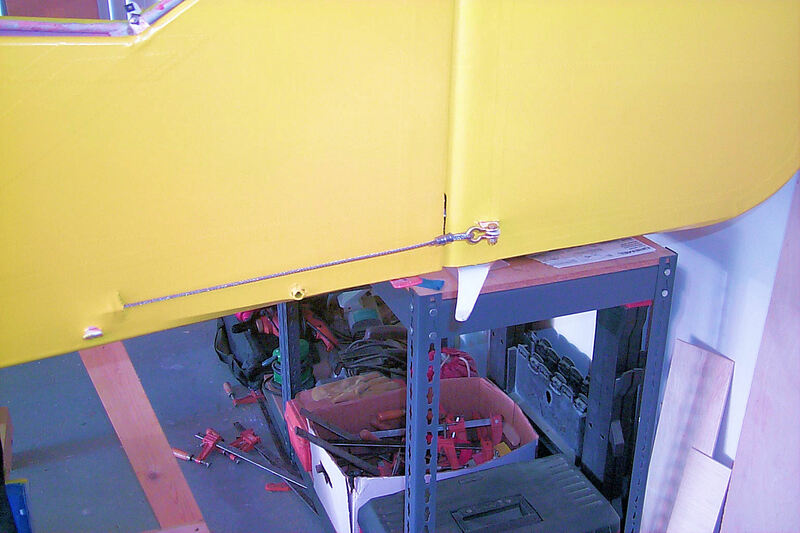 1-3 December 2013: Securing the boot cowl to the top of the firewall. 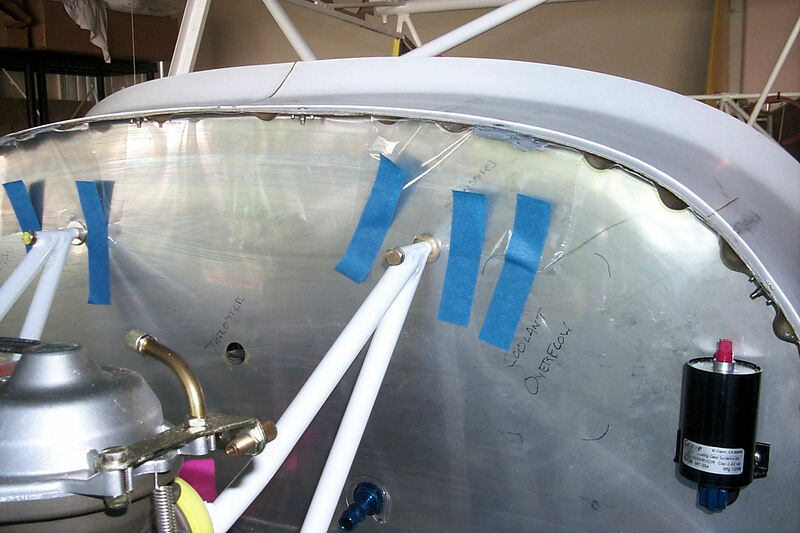 Even though the cam-lock fasteners that attach the upper cowl to the firewall will also hold the boot cowl, I wanted the boot cowl secured to the firewall at times when the upper cowl is removed. 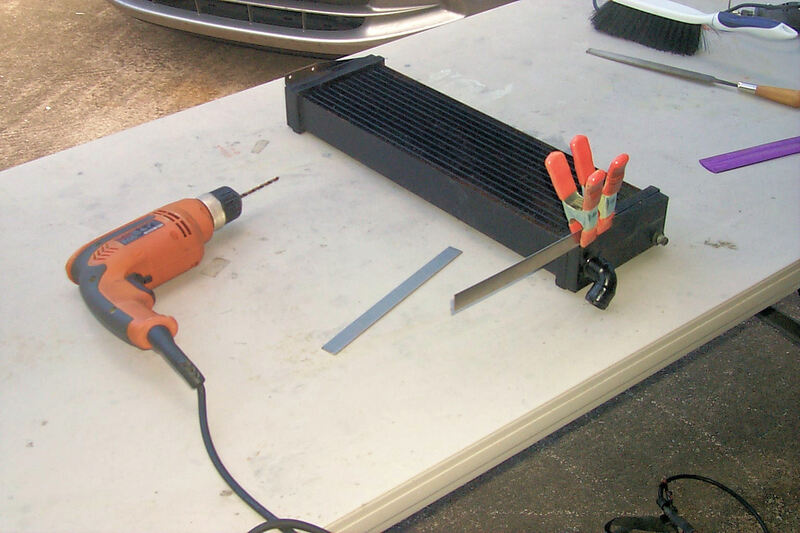 I used flat head screws mounted to nut plates riveted to the firewall. 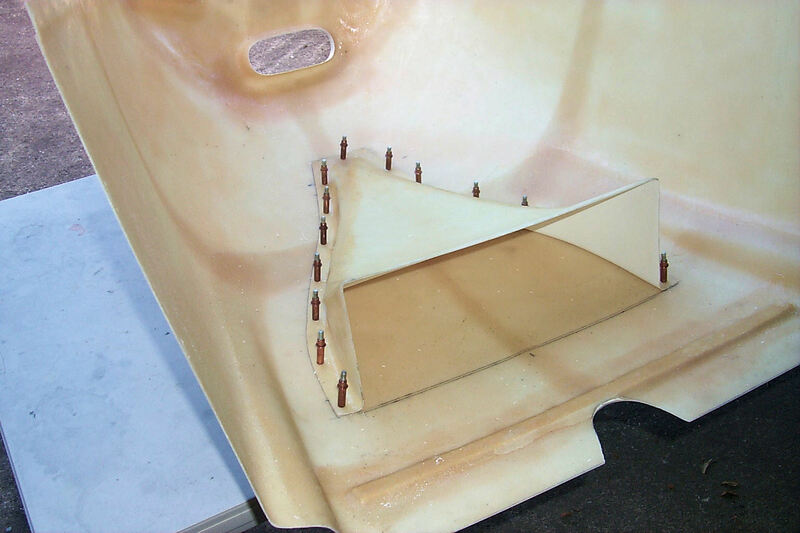 The problem is that the screws created waves along the top of the boot cowl. My solution was to remove the offending screws and fill the gaps with Hysol. You can see that I'm preventing the epoxy from adhering to the firewall with plastic bags. When the Hysol is cured it will create standoffs so the screws will come home in the desired position. 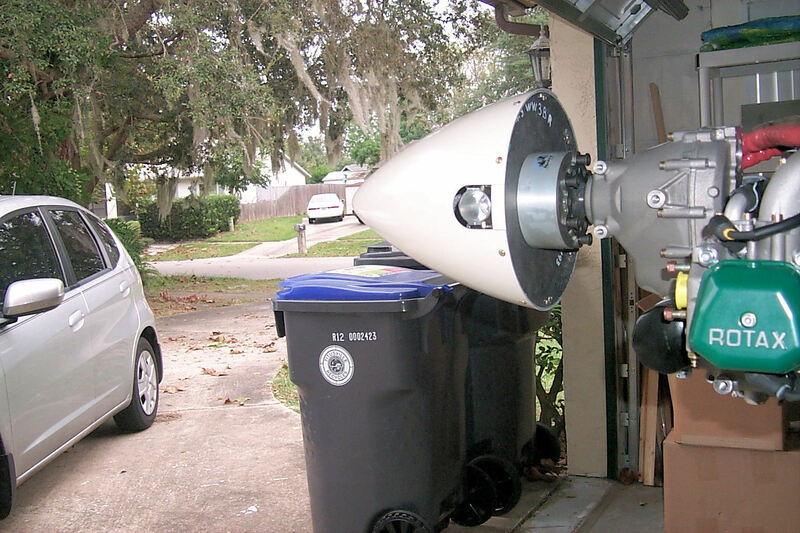 6 - 8 December 2013: The cowl is fitted and secured with clecos. There are a number of places that need Super-Fil. 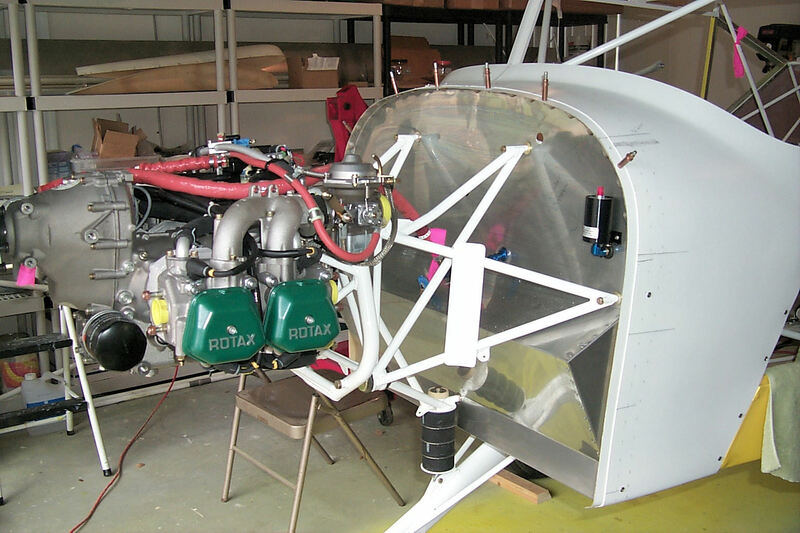 15 December 2013: So what does the radiator have to do with fitting the cowling? 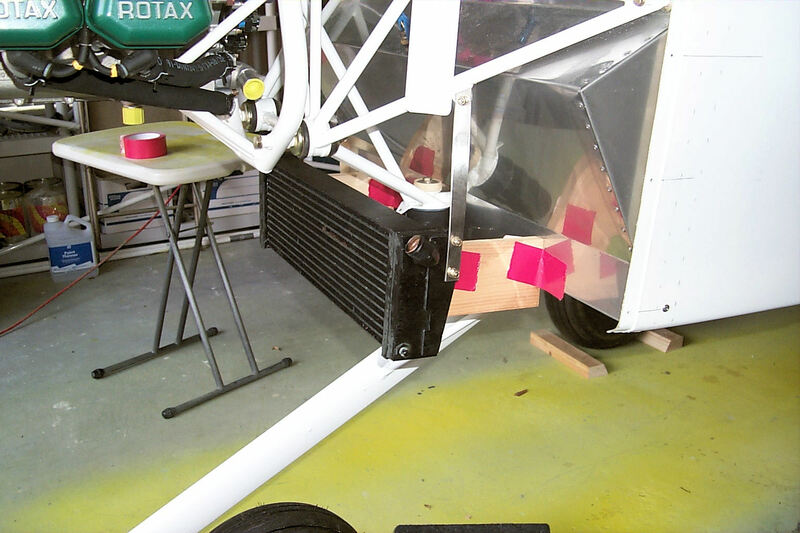 Well, I have to mount the radiator in its final position before I can install its air duct. 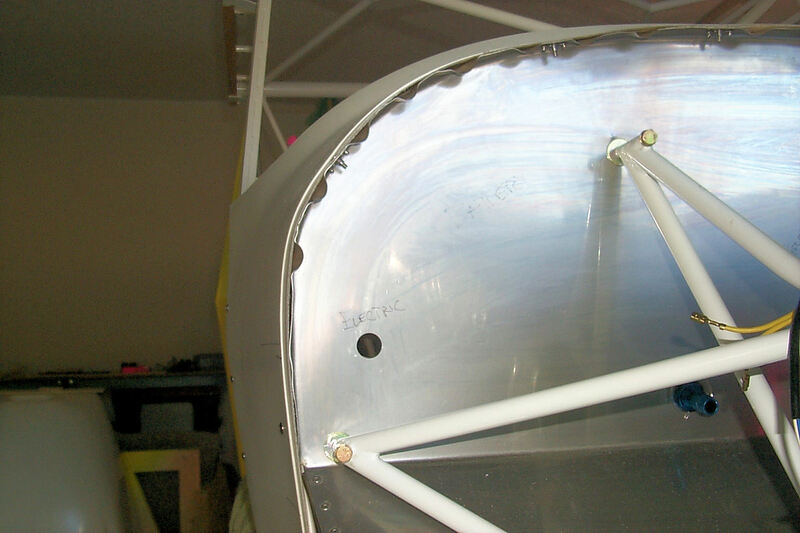 In the second photo you can see the pencil marks on the bottom cowling indicating where the radiator should be. I've temporarily fixed the position with wood blocks. 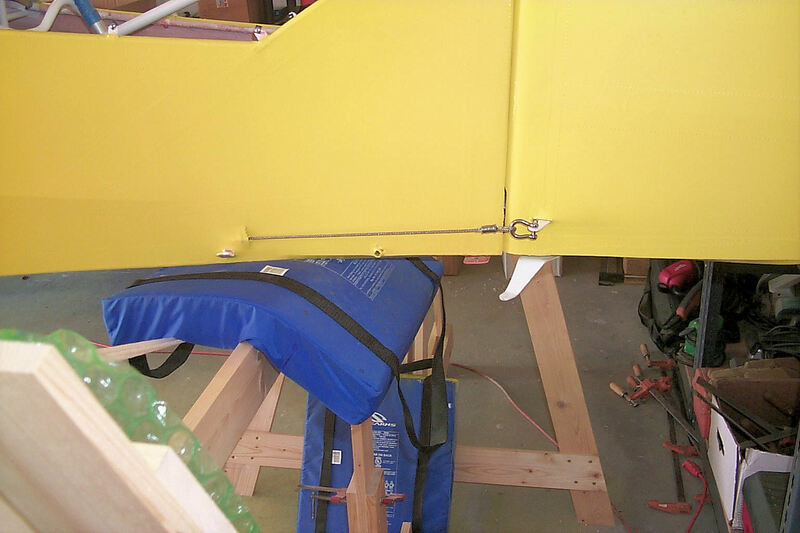 In the third photo I've removed the cowl but, the blocks are taped in place to hold the position. In the last photo I've positioned the center mounting strap. It's secured to the radiator with one rivet. It should be three rivets. My rivet driver broke. The other two rivets will have to wait. 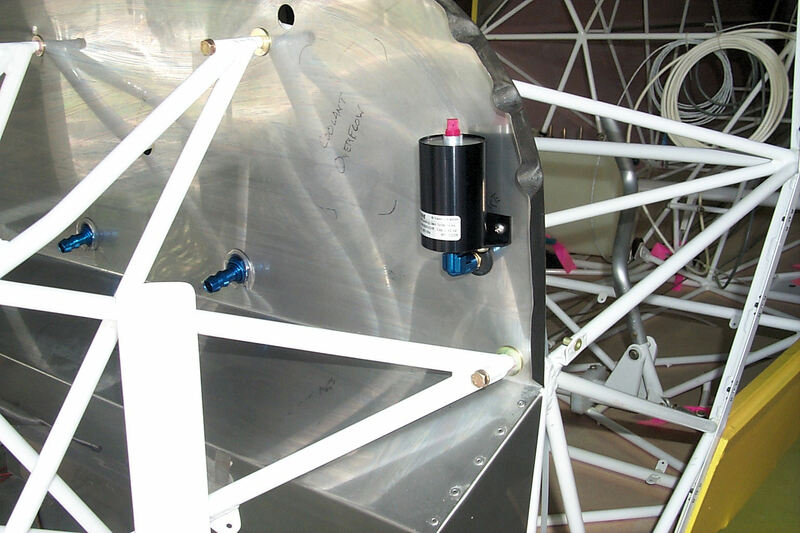 16 December 2013: Marking the cooling duct. 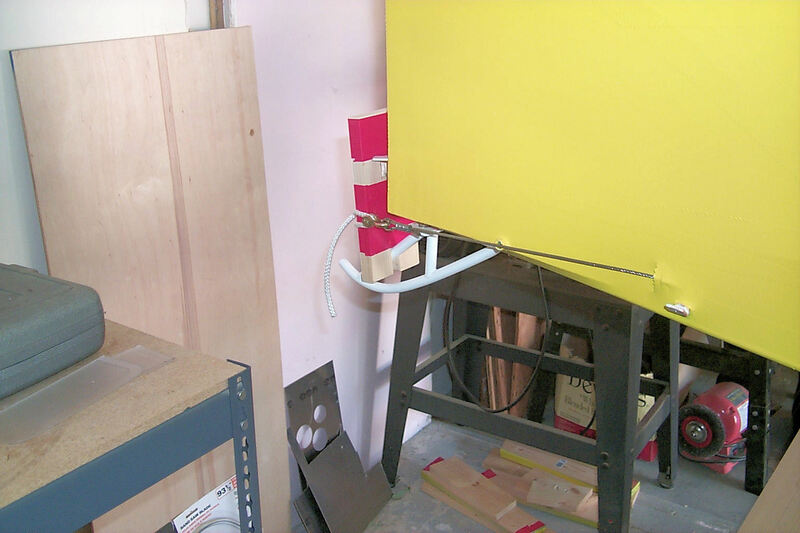 18-20 December 2013: Plumbing the radiator: It wasn't necessary to do this now but I wanted a break from cutting fiberglass. 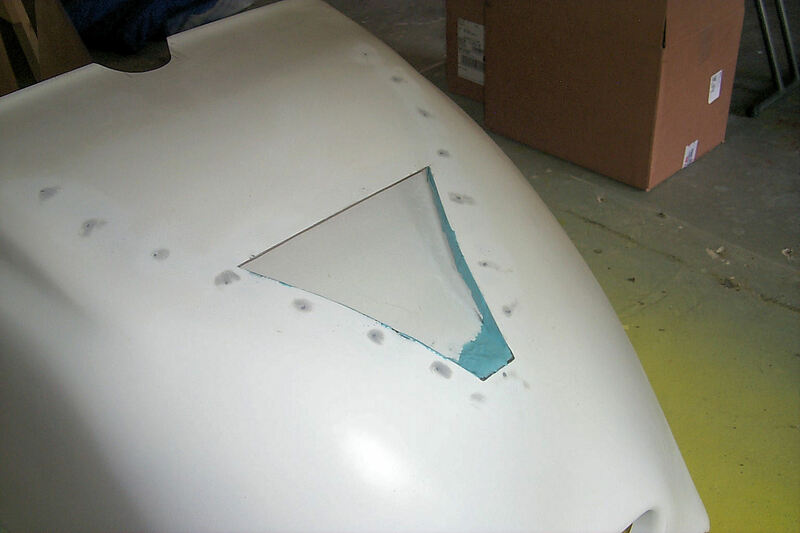 Soon enough I'm cutting fiberglass: Trimming the cowl duct to fit the radiator. In the first photo you can see that I've trimmed it pretty close. 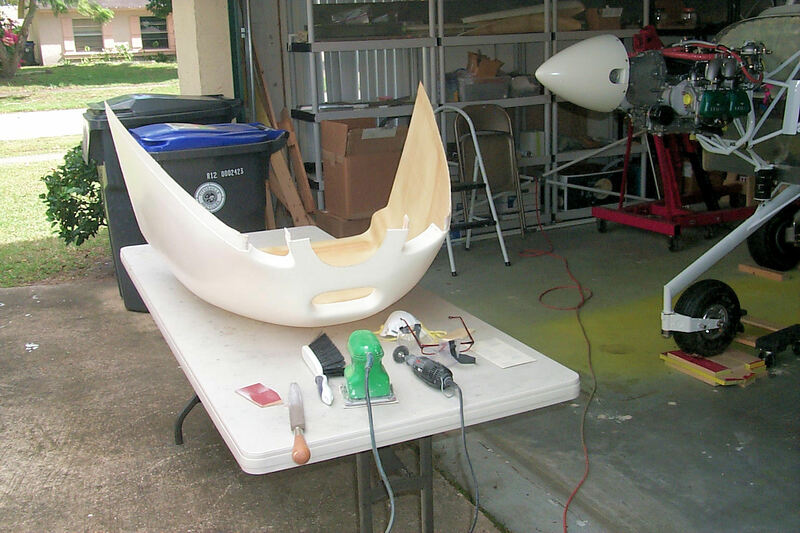 22 December 2013: Cutting and fairing the cowl duct. Here you can see the Super-Fil curing. 23 December 2013: After quite a bit of elbow grease. 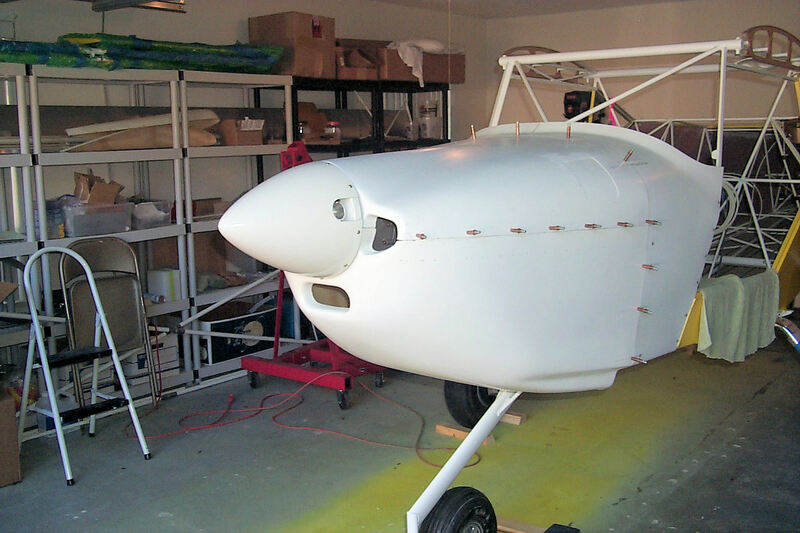 It's pretty fair but there will be more to do after the first coat of primer. 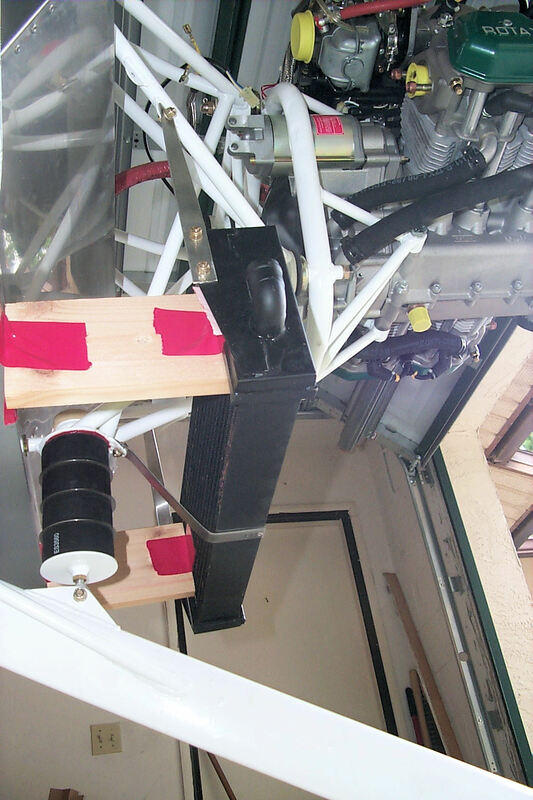 First task is to mount the oil tank. 1 January 2014: Happy New Year!! Work on the kit has been intermittent over the holidays but the last two days have been productive. 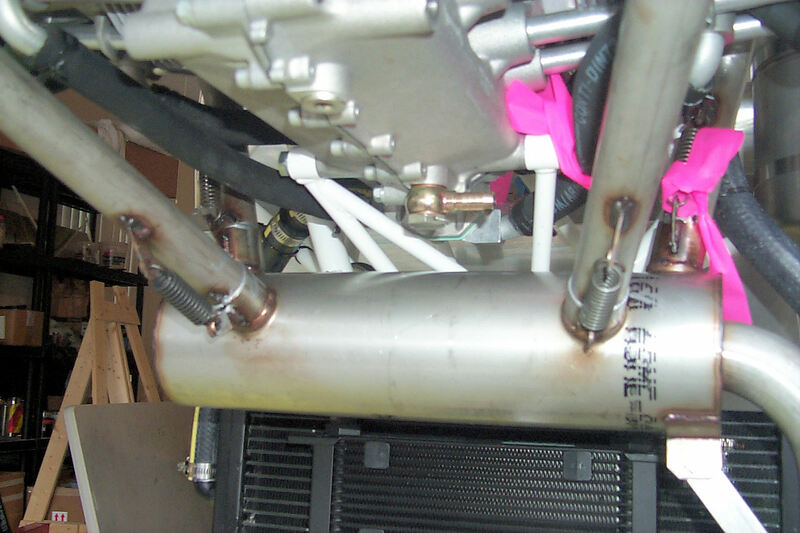 In this photo you can see the oil cooler attached to the radiator. 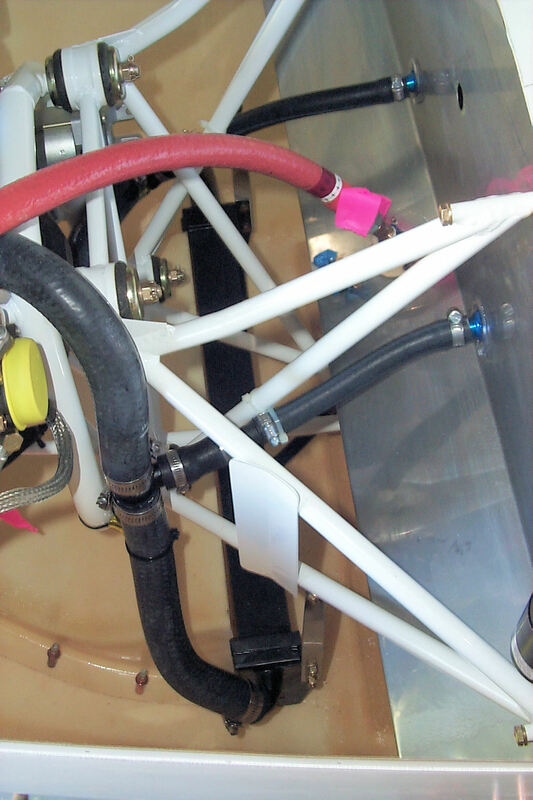 When trying the route the oil lines I quickly realized that have to have the exhaust system in place. I have to be certain that no oil hose will touch a hot muffler or pipe. This was one project that was quicker and easier than I expected. Back to the oil system. 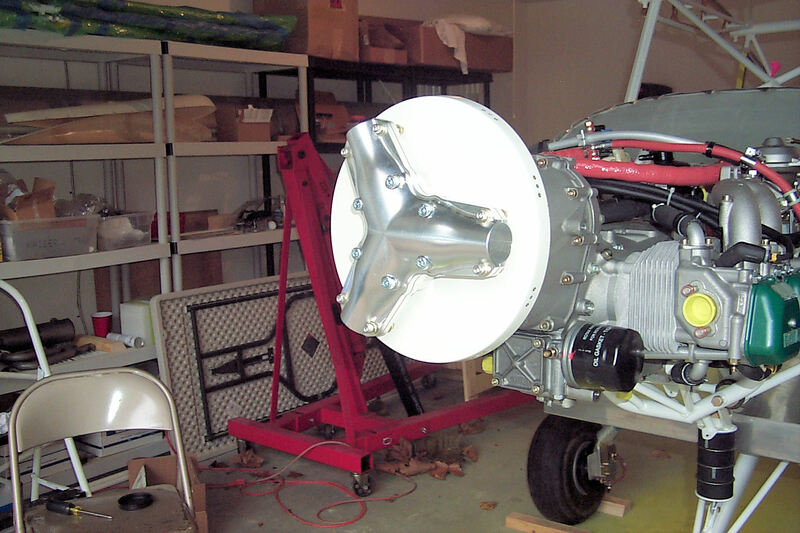 Installing the banjo bolt. 2 January 2014: A lot of pink tape. The oil lines are temporarily in place. I'm waiting for a shipment of firesleeve to finish installing them. The pink tape reminds me there is more to be done. 3 January 2014: It's colder that lizard snot in Florida! A rare day in the 40's. 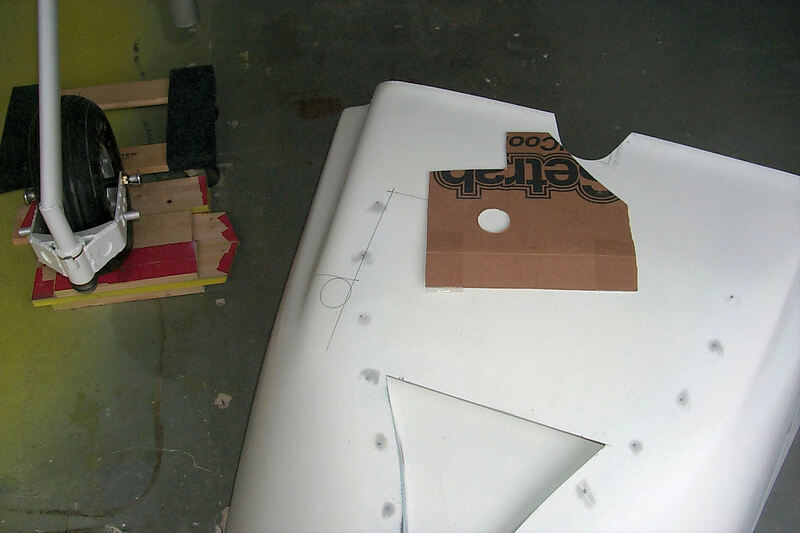 I managed to make a cardboard pattern that spots the position of the exhaust stack on cowl. I'll do the cutting over the weekend when it's predicted to be much warmer. 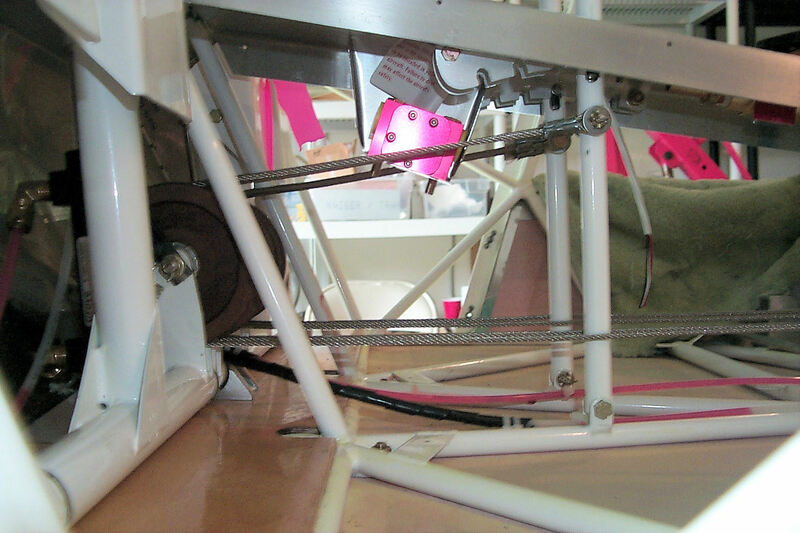 4 January 2014: The exhaust springs are safety wired and RTV is applied to dampen vibrations. 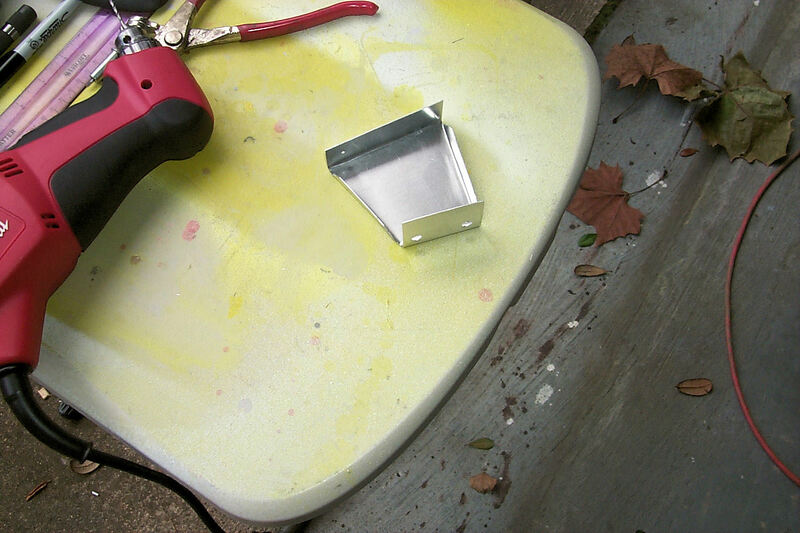 5 January 2014: I cut the end of the exhaust stack at a 45° angle. First I expanded the drawn hole 1/4 inch. Because of the curvature of the cowl it wasn't even close to being correct. 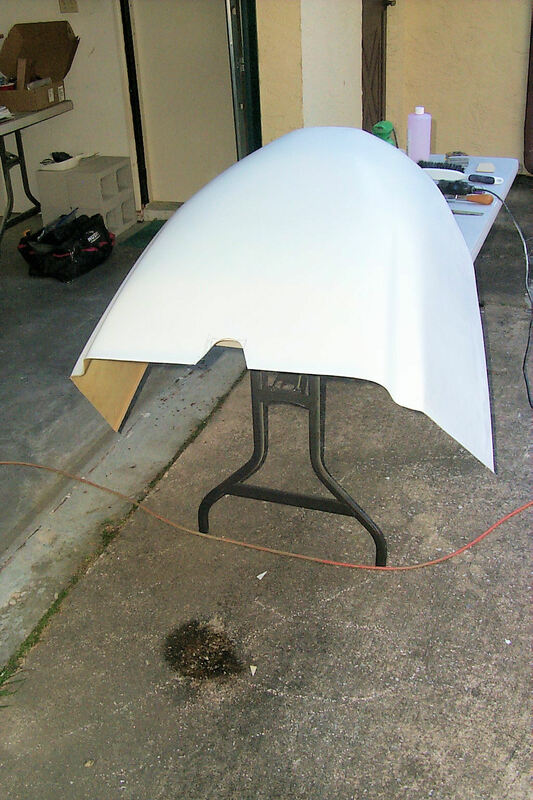 Through 4 or 5 attempts I finally was able to get the cowl on without the stack touching the sides of the hole. I then was able to measure a uniform distance around the stack and do the final cut.